With the development of the oil reserves following the end of the Second World War, it became increasingly evident that important visitors to the State should be able to enjoy accommodation that was of an international standard. The hotel industry had yet to achieve that quality, though the Oasis hotel on the Ras Abu Aboud Road was used to house important visitors into the 1970s. Consequently, in the 1950s the Guest or Marmar palace was constructed in Rumaillah, this view of it taken from the north-east, and within its secure perimeter wall, shows it set behind its rear garden, facing directly north. There is a little more noted about it further down this page as well as on one of the pages looking at old images of Qatar. As can be seen from the photograph, the building had none of the characteristics of the traditional architecture of the peninsula or region, but was designed in an international style with similarities to colonial architecture of the Indian sub-continent, particularly with the styling of the arches and the use of verandahs. For the most part the State was catering for visitors from Arab states and was following the badu traditions of hospitality, the Marmar Palace becoming the home of State visitors – usually Heads of State – for the time they were in the country. At the same time, those running the country were beginning to come to terms with their need to deal with the political and administrative issues arising from their increased exposure to the rest of the world, and to find the necessary spaces to accommodate increasing personnel. In order to cater for the nascent government organisations that were required to deal with both national and international functions and relationships – particularly political and administrative – a number of buildings were raised, many of them ranging along the newly developing Corniche. This photograph, taken in 1974 shows, from right to left, and looking over the dilapidated roofing of the old suq, the Shari’a Courts building, Government House and the top of the new concrete vegetable suq. The tops of the Ports warehouses can be seen above it on the left hand side of the photograph. Government House, one of the earliest of these, was constructed at a site to the east of where Grand Hamad Avenue now meets the Corniche, and north of the suq al-samak, or fish suq. The concept for the five-storey design was relatively simple. Organised with a central spine corridor running east-west, offices were located on its north and south sides with an off-centred ceremonial entrance and staircase at first floor level, accessed from a vehicular ramp, and a functional secondary staircase at its west end. The external designs for the north and south façades were treated similarly, though it was only the south façade that had to deal with solar gain. An external balcony ran along the building on the top floor and this, together with the roof above gave some relief from solar gain for the top two floors. The lower floors picked up considerable heat in the south offices. The structure was of reinforced concrete and concrete block, as were most of the early buildings. It was from this building that the Prime Minister initially directed the development of the country, along with a variety of national and international administrative and financial functions. Before Government House became the building from which government affairs were run, I understand that this building – which was known as the Ministry of Municipal Affairs from the nineteen seventies onwards – fulfilled that purpose in the nineteen fifties and sixties when it was known as Government House. It was situated in an important position, close to the Diwan al-Amiri to its west, as well as the Political Agency to its south-west. Prior to Qatar’s Independence on the 3rd September 1971 the Ministry of Finance, instituted in 1960, and the Ministry of Petroleum were run from this building and it initially housed briefly, among other government uses, the office of John R Harris, the designers of the hospital at Rumaillah as well as of other buildings in Doha. Directly east of the Diwan al-Amiri, the building faces north and was given an arched façadal treatment that suggested something of the traditional architecture of the peninsula, but with a much lighter touch. What might appear to be a four storey main building with two storey wings was constructed of concrete floors, columns and beams on rising land with the main block essentially two storeys, and with the two arms enclosing a formal arrival square protected by a guard post at the entrance gate. To its right, in the first of these two photographs, was an old hospital, constructed along more traditional lines with an external balcony and classic column and beam construction. The first of these two aerial photographs shows that some alterations were made to the top floor of the main building where the Ministerial suite was situated and, in the lower, later photograph, more alterations were made at that level. The top two storeys of the main building originally had balconies giving access to the internal rooms, and it is possible that the upper of the lower two floors of the north-facing block also had this arrangement. But the east and west facing wings had deep reveals which would have given protection from east and west solar issues while helping to reflect light into the rooms behind – though my recollection is that the rooms were relatively dark. The building has been renovated but, at the beginning of 2018, is unoccupied. 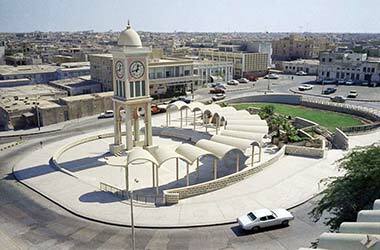 While not a functional Government building, for many years the Clock Tower in Doha was seen as the main identifying feature of the State. It was used by the Government to represent the face of the State in many of the early Government informational and publicity documents, its image being reproduced on the cover of books as well as on posters and postcards. While most of those photographs were taken of it from ground level, this view was taken in 1971, looking south-east, from the Diwan al-Amiri and shows, directly behind the Clock Tower, the Darwish Travel Agency offices. Immediately to the right of this is the old British Political Agency building and, to the right of that, the Department of Labour and Social Affairs with the road leading to the suq separating it from the complex which, in 1976, was developed into the Qatar National Development Exhibition building. This aerial photograph, taken in 1972 and looking south-west, illustrates the Clock Tower’s relationship with the Grand Mosque to its south-west, and the Diwan al-Amiri to its west. To its north-east was the Darwish Cold Stores, out of picture on the bottom edge of this photograph. The structure, and its surrounding development, were developed in 1956 as a feature of the new roundabout which was designed to link the Rayyan Road with the suq to the east as well as giving importance to the access for the Diwan al-Amiri. On plan, the Clock Tower stood in the centre of a depressed pedestrian area with steps leading up to a landscaped area mainly to its south – the site having a significant fall from south-west to north-east. Surrounding the tower was an insitu poured concrete shade structure having fourteen barrel vaults mimicking a crescent moon on plan, tapering at its ends, its plan centre being at the south-west of the tower and supported on slender circular columns. The garden was rarely enjoyed by members of the public due to the difficulties of access and security. The projecting base of the clock element of the tower was supported on four square concrete legs, themselves sitting on small blocks, the top of the legs being connected with four arches in the form of simplified ogees or onion shapes similar to, but different in their proportions and shape, from those of the façade openings of the adjacent Diwan al-Amiri. Below the clock faces were three vertical panels of green ceramic mushrabiya to give ventilation to the clock mechanism, each of the panels separated by plain white columns. The design of the clock tower was completed by a finial over a vertically elongated dome sitting on top of its surrounding base which was decorated with a simple dentillated and perforated pattern with small spheres marking the corners. The structure had a rendered finish and was painted white with pale green and pink areas picked out for contrast. Also for contrast, the barrel vaulted structure surrounding the tower was also painted white. The four clock faces displayed the time with black Arabic numerals of uneven calligraphic character against a white ground. Each face was divided into twelve but with the central area being decorated with an eight-point diamond pattern. While the roundabout was relatively accessible, and designed to allow pedestrians to sit there, it was rare to see pedestrians on it due to the nearby security authorities at the Diwan al-Amiri entrance. There is much that has been noted elsewhere about the Diwan al-Amiri building, but it worth mentioning something of the original intents at landscaping its immediate area as this was an important element of early urban design in Doha. With the work of government being directed from Government House it was decided in 1972 that the complex being constructed for the previous Ruler, Sheikh Ahmed bin Ali al-Thani, would be transformed into the seat of the Head of State. In the first instance, only the main structure to the east would be converted, with that to the north-west reserved for later expansion. These four aerial photographs illustrate something of the development of landscaping to the north and east of the Diwan, seen as the most important area for landscaping treatment. They images were taken respectively in 1972, 1973, 1974 and 1976. In front of the building, and adjacent to its main entrance, would be provision for staff parking and, between that and the new Corniche, would be a landscaped area designed along a formal arrangement. Seen here under construction in the first two photographs, the significant drop in level between the staff parking adjacent to the main entrance to the Diwan would be first filled and then treated as two half-moon arrangements with a central staircase leading down north. It is said that the original concept was modelled on Edinburgh Castle. The development of the area between the stairs and the Corniche was realised, though access to it and, particularly, to the lower car parking was withheld. As can be seen both in the above photograph and this, the planting adjacent to the east facing wall of the south wing of the Diwan al-Amiri, was not considered as an element either of the Clock Tower landscaping, nor of the staff car park and the landscaping extending to the north. The acacia trees that had been planted in the 1960s were allowed to grow while, below them, there was a tarmac access lane with concrete pavers and a small amount of planting. A steel fence protected the area against access from the road and pavement around the Clock Tower. The early development of the Diwan al-Amiri complex had entrances both from the east as well as from the south. This first photograph looks down towards the south-west on the landscaping development outside the south entrance from the minaret of the Sheikhs’ mosque. The entrance to Sheikh Suhaim bin Hamad’s palace can be seen at the top centre of the photograph. The south entrance to the Diwan al-Amiri development was approached along a wide road, each side of which was flanked by a formally laid out garden, but protected by a light wire mesh fence from that road. The road focussed on the entrance which had a religious exhortation above it. Both sides of the garden had a quadripartite arrangement after the manner of Islamic gardens, but there were no water features deployed, other than for watering the grass, shrubs and trees, and no real effort was made to use planting in a formal or symmetrical manner. These gardens, too, were protected from the external public road by a decorative steel fence for security reasons, and access was restricted. Both the south and east entrances to the Diwan al-Amiri were protected by the military, but the south entrance had the more traditional look having a long defensive wall with its entrance flanked by projecting guard posts and its two circular corner towers. On the higher ground, south-west of the Clock Tower roundabout and facing across a car park onto the eastern beginning of the Rayyan Road and the southern entrance to the Diwan al-Amiri, shown above, was a row of three, two-storey buildings that comprised the Presidency of Islamic Courts and Religious Affairs, seen here on the left, the Traffic Police, and the central Fire Station on the right – the aerial photograph showing them having been taken in early 1974. While there is an obvious connection between the facilities for fire and police, it is unclear to me why the shar’ia building was located next to them. However, it is possible that the land was given to or purchased by government and these were the first functions needing housing. The Sheikhs’ masjid and an associated awqaaf building are nearby to the north-east of these offices. This was an interesting group of government buildings of mixed use and architectural character dating from the mid to late late 1960s. It is not possible for me to state authoritatively when their functions ceased, changed or were moved, but an examination of the aerial records of the area show that the buildings had all been demolished by August 2006, presumably to make way for the Musheirib project. The original note I wrote about this grouping was mistaken in that it identified the buildings incorrectly. This note has been re-written in order to make a more accurate record of the purpose of these three buildings. A two-toned, two storey building, the architectural treatment of the offices of the Presidency of Islamic Courts and Religious Affairs was similar to many of the residential structures being developed in the 1960s and 1970s. Constructed with a concrete frame and floors, and with concrete block infill walls both internally and externally, its façadal treatment relied on contrasting rendered and coloured panels to break down the building’s mass. Further visual relief was obtained on its east and west facing façades by the incorporation of vertical column features. Although similar to many of the developing residential stylings in its layout, the expressed staircase element of the design was off-centred and grouped with the entrance door to create a more formal entrance lobby. Compared with the adjacent Traffic Police building, its floor to floor height can be seen to be greater than was usual. Not having been in the building it is impossible to say how it was organised internally but, looking at it from the outside it appears to have been conceived as an apartment block with four units. Compare it with this apartment block, the pattern for many apartment blocks. The Traffic Police building may also seem to have been similar to many early residential buildings, albeit on a smaller scale. It has something in common with government buildings constructed as residences for expatriate staff coming to the state to work in the 1950s and 1960s and would have pre-dated the building to its east. If that is so then it would have been designed to accommodate four apartments, two on each floor, and used as offices, complete with the original bathrooms, as I remember the building. Its design vocabulary suggests it was constructed prior to the adjacent offices of the Presidency of Islamic Courts and Religious Affairs. Designed about a central axis, the façade had its front parapet raised, a device to create a more imposing or authoritarian face to the public, while a board over the door described the necessary information on the building’s purpose. Note that the staircase was not carried up to give access to the roof, a normal requirement to access the standard water tanks. As Doha grew, Fire Stations were established at the airport and here on the west side of the centre of Doha, its location being considered as central to the developing pattern of the city and enabling relatively easy access in case of fire within Doha. While this may have been sensible in the 1960s, the pace of development, the relatively narrow roads and haphazard vehicle parking along them made it increasingly difficult to disperse appliances rapidly. Later, in the 1980s another, more modern Fire Station was developed at Rumaillah, near to the fort where it would also be able to serve the rapidly developing west and north areas of Doha and Rayyan. The Fire Station was constructed as a reinforced concrete framed structure with concrete floors and concrete block walls, the spacing of the columns allowing each bay to house a vehicle. Access to and from the development was from a courtyard situated on the south of the block, and which led directly onto Abdullah bin Thani roundabout. I’m unable to say how many appliances were situated there and can only recall a number of water tankers. I don’t recall any appliances with ladders, yet there must have been. A little way south-east of the Clock Tower roundabout, and facing over a carpark to the entrance to the Sheikhs’ masjid, was the building housing the Ministry of Labour and Social Affairs – seen here photographed from the minaret of the Sheikhs’ masjid in February 1974. The building was created as two blocks of different styles; that on the south had window openings surrounded by a projecting frame giving a small degree of shading to its façade, while that facing west was protected by a mushrabiya or egg crate arrangement to give protection from the setting sun. By the beginning of 1972, and the accession of Sheikh Khalifa bin Hamad al-Thani, previously acting as Prime Minister, a number of smaller government buildings had been constructed, many of them on or near the old foreshore, now some way inland. In order to cater for the growing demand for fresh produce, the vegetable suq was developed immediately adjacent to, and east of the three-storey Darwish family office building, which can be partially seen on the right of this first, aerial photograph. Designed as a row of seven free-standing vaults, there were no wall enclosures on the north and south sides in order to allow and encourage air movement. Advantage was taken of the qualities of reinforced concrete to form both the columns and vaults, with a row of small uprights or mullions stiffening the vaults at each end. It was a novel building in its time and might even be argued to have some resonance with the traditional architecture of the peninsula. Behind the vegetable suq in the photograph above, a long single-storey can be seen. This was the meat market, one of two identical buildings established for the sale of meat and fish. This photograph, also taken in 1972, is of the fish suq which was located around a hundred metres east of the meat suq. Both buildings would have benefitted from larger windows or a more natural system of air-circulation – as well as better natural lighting. Immediately to the west of the fish suq was the Central Post Office. A two storey building – despite its appearance – its first floor had access to the offices by way of an external balcony surrounding it. To some extent this gave protection to the windows of the offices, despite the main axis of the building being oriented north-south. At ground level, on its west side were the numbered post boxes requiring a daily visit to retrieve some commercial and all personal post. It was surprisingly efficient bearing in mind the number of people collecting their mail every day, there being no delivery system as there were no standardised addresses. It is worth noting that Qatar had significant importance for numismatists, with a good number of new stamps and first day covers issued each year. The Post Office was found to be too small for its purpose by the mid-1970s, and a much larger building was established at the southern end of the New District of Doha to cater for the growing needs of the State. To the west of the Central Post Office, and set back from the road, was the Ministry of Education, here seen in 1974. It was planned as a thee-storey double-loaded corridor access building on an H-shaped plan. I remember it having a significant number of occupants organising, regulating and collecting the various statistics for the increasing numbers of students up to tertiary level. Though there was not, as yet, a university in Qatar, there was a technical training institute at Medinat Khalifa. The three-storey Ministry of Justice Courts building was situated immediately to the west of the Ministry of Education and to the east of the vegetable suq. I believe it may also have been known as, and functioned as, the Shar’ia Courts building, but am unsure. The building had a delicate appearance compared with both other government buildings constructed around a similar time, but also with the traditional architecture of the peninsula. Its character was created by the long, flat roof line and the vertically emphasised screen or mushrabiya which protected the two upper levels of the internal structure. Closer to the building additional interest was created by the incorporation of coloured glass in the mushrabiya. Further to the west, at the junction where the road leading north from the suq met Abdullah bin Jassim Street, there was the three-storey Darwish office building on its east side and, on its west, were two two-storey government buildings: the Central Police Station on the south side of Abdullah bin Jassim Street, and the Customs House on its north side. From its central position, the Central Police Station was able to take over the protection of the suq, previously the subject of private contracts between merchants and badu guards. Its primary function was not only to control and protect the commercial activities of the suq, but also to monitor activities associated with the movement of goods into and out of the old port and along the adjacent old shore line to its west. Policing of the peninsula was directed from the fort at Rumaillah. From the Customs building, control was maintained on goods landed in the old port as well as those brought directly ashore on lighters from the larger vessels that had to stand out in the deeper water, and then moved to storage directly on the land belonging to merchants such as al-Mana and Darwish. These families created storage facilities on the old shore line as an extension of their living accommodation though, by the early 1970s, some of the families were moving some or all of their commercial activities to larger premises away from the centre of Doha, as well as the residential components of their sites. The first photograph shows the building from the north, while the lower aerial photograph was taken two years later from, approximately, the south-west. Both government buildings were constructed of concrete block with in-situ concrete frame and floors, the classic system used in nearly all buildings subsequently. As can be seen above, the Police Station had a protected access and small windows, while the Customs building had a viewing gallery at second floor level, giving it good views to activities across the bay to the open sea beyond. Immediately to the east of the Customs building, and across the connecting road link between the suq to the Corniche, the government constructed offices for the Qatar Monetary Agency, construction beginning in 1974 and the building in use by 1976. The building consisted of a relatively short tower element with a double skin of glazing sitting over a windowless horizontal element that was raised from ground level and approached by a double ramp on its south side. This was the first building with a completely glazed façade to be constructed on the Corniche. More images of it can be found on the third of the pages looking at Islamic urban design in Qatar. To the west of Government House, and immediately opposite the Ministry of Municipal Affairs to its south and the Diwan al-Amiri to its west, the Ministry of Foreign Affairs was constructed in 1976, shown in this image from the south-west. Its façade mixes square, rounded and flat pointed arches in a very two-dimensional design which treats the south and north façades in the same manner – despite different solar conditions – but leaves the east and west to reflect only the double-loaded corridor planning of the building. It is only the pointed arches that give any hint of the part of the world for which the building has been designed though, to be fair, the deeper set windows and some mushrabiya suggest that it was designed to protect against a hot climate. Regrettably, it is not a building demonstrating anything of the tradition of the country, or even the region. It is instructive to compare it with the older building, Government House, located a few hundred metres to its east and which, while having no local architectural vocabulary in its design is, nevertheless an honest expression of this form of office building. Here is the Ministry of Foreign Affairs again. This photograph was taken in 2002 and views it from the north-east, focussing on the extension added to its east end reflecting the State’s expanding diplomatic interests. The extension was designed to contrast with the office block character of the ministry, and was placed at its east end, connected with a link structure. It differed stylistically from the earlier building, expressing a projecting element in its top north-east corner and having a tall vertical window at 45° looking north-west towards the New District of Doha. It represented an external vision of Islamic design contrasting with the simpler traditional styles both of the peninsula but also the original building. An attempt was made to replicate the scale of the tall arched façade of the original building, but this was let down by the continuity of the vertical elements compared with the original, as well as by the heights and massing of the extension compared with the original. The ministry and its extension were demolished in 2011 along with the other buildings in this block between the Diwan al-Amiri and Grand Hamad Avenue, their place being taken by landscaped gardens. The crenellated structure on the left of the photograph is one of the ceremonial arches erected from time to time through which parades pass along the Corniche. Construction of the Ministry of the Interior was begun in early 1976. Due to its activities and purpose it was seen to be immiscible with other government ministries and was developed as an exception to the government ministries competition that was being considered at that time. However, being sited to the west of the Diwan al-Amiri overlooking the Corniche at al-Bida, in the centre of the area allocated to the competition, its location was to prove difficult in any development of that project. The building’s construction was of cantilevered in-situ concrete floors with its internal walls of the standard concrete blocks. The external fins were also of in-situ concrete, then rendered. The two construction photographs show that the building was designed to have entrances serving different functions on all four sides, the most prestigious being that fronting the Corniche. The Ministry design was a sensible approach in some ways to the problems presented by design in the climate Qatar enjoys. Two features – the projecting roof and floors, together with the vertical fins – give a degree of protection to the fenestration from much of the sun that might fall on it. The arches cut into the projecting parapet serve to pay lip service to traditional Qatar architecture, though the large mass of building and, particularly, the long, unrelieved, roof line do not. As solely a design feature and not a representation of a structural roof, it seems illogical not to take these arches around the roof. This view of the Ministry is taken from the Corniche, and is of its north face where the oversailing features and fins are not needed; but it was still a reasonable solution to the problem of designing an office block. These two photos are of the Ministry of Finance extension to Government House, a design carried out by the famous architect, Kenzo Tange. The building also faces north although a four-storey high, and significant design element, is modelled at 45° to the façade of Government House. The design makes no attempt to use any of the national architectural vocabulary but is carefully articulated in the manner in which it relates to the old Government House to which is is attached. The end of Government House can be seen on the right of the extension. The balcony on the top floor was not seen as a solar protection device but a verandah to take advantage of the views north across the corniche and into the New District of Doha. The glazed screen to the left is protected from solar gain of the sun setting in the west by the main building. It has been argued that the character of this architecture might be seen anywhere and does nothing to promote Islamic design, however I like the way it resolves the problem of adding to what was a historical building – Government House – by allowing the latter to slide under it in a well-balanced grouping. The manner in which it was designed enhances the new grouping, but does so without dominating it. Here is the scheme shown from the north-east under construction in November 1983. The project was initiated and the design stage of the project begun in June 1978 with the working drawings being approved in June 1979. I am not able to say when work started on site, but it was completed and the building occupied in 1984. While the design was executed by Professor Tange, the structural, mechanical and electrical consultancy for the project was Garmeco, based in Beirut. These two photographs are of the finished model of the scheme; the first shows the scheme from the north-west, the second from the south-east. Photographed in June 1980, they give a better understanding of the conceptual three-dimensional relationship of the extension to the existing Government House. Like the Hotel and Conference Centre, the Ministry extension has a character that accords with basic principles of Islamic design in that it has a heavily protective outer shell responding to the environmental conditions, and enclosing a central space similar, in many respects, to a traditional caravanserai. Designed as a secure building it nevertheless appears to be more approachable than some official buildings and, from its interior enjoys magnificent views north-west over the West Bay to the New District of Doha. This view from the sea shows the full elevation of the old Government House together with the extension for the Ministry of Finance. It clearly illustrates the dominating mass of the extension and its rôle in drawing the older building under it and into a sensitive grouping – despite the differing characters of the architectural styles of the old and new buildings. It should be noted that I’m not that sure I have the official title of the building correct – the Government photograph from which this illustration was taken gives the name as the ‘Customs Department’ – but it was the Port Authority building by which I knew it in the 1970s when this photograph was taken from what was known as the Port Roundabout, the latter being the point from which access to the main port jetty was gained. I understand that the building might have contained both operations in the early 1970s. This port is not to be confused with the original port – known by many as the ‘country craft’ jetty, directly north of Doha’s main suq, and west of this building. Control of the ports in Qatar was originally given as a concession by the Governor of Qatar for a percentage of the customs duties being received. Sheikh Ali bin Abdullah al-Thani, changed this arrangement, establishing a General Department of Customs some time in the 1940s as one of the eight State departments. This structure was changed in 1970 with the department being moved to the ambit of the Ministry of Finance and Petroleum. The activities of the old commercial port in Doha, as well as other harbours in the peninsula, was directed from the Port Authority building in Doha. The building was a double-loaded, corridor-accessed, two-storey structure with a brise soleil on the front, south-facing façade to give a degree of protection to the glazing set some way behind it. The rear or north-facing building was treated with concrete vertical fins, though this was a little unnecessary, while also limiting oblique views across the goods yard, as can be seen in the second photograph, taken in 1974. For its time this was a very modern building in its architectural treatment of solar gain, and was similar in some respects to the school buildings being erected for the Ministry of Education. Situated at the junction of the al-Meena and Ras Abu Aboud Roads, the Public Library, (dar al-kutub – literally, ‘house of books’), also known as the Qatar National Library, was founded on the 29th December 1962, establishing a home for a growing collection of Islamic books and manuscripts, the latter being transferred later to the Qatar National Museum. The library was established under the jurisdiction of the Ministry of Education and was the first public library in the Gulf. The architecture of the building adopted a style that was seen in other buildings constructed around that time with extended rounded arches the predominant feature of the west-facing entrance façade. This façade was detailed to keep the columns that supported the arches relatively slim, the columns and being given a dark colour – I think they were a green mosaic – in effect masking their visual importance to the structural integrity of the façade. Additionally containing books in a number of other languages to Arabic, at some time in the 1990s the Library was expanded by the addition of a second floor. The architectural design continued to maintain the character of the original single storey building, the main and south façades of the first floor extension being given a similar treatment to that of its original south façade, and with mushrabiyaat added to the first floor openings in order to give a degree of protection to the spaces within. A new building now houses the Qatar National Library. Designed by the Dutch architect Rem Koolhaas it is situated in Education City and was opened on the 7th November 2017. By the 1950s the government was intent on ensuring education was available to all children as well as, a little later, adults. It was evident that there was a need to produce schools for the increasing numbers of children in the peninsula, and that they should be located relatively close to their demographic areas. 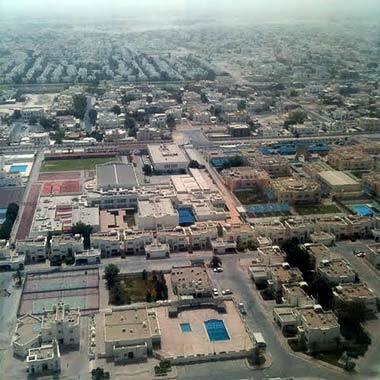 Primary and preparatory schools were the priority, though there was also a technical school established later at Medinat Khalifa, and adult education was being discussed. To this end, the State produced designs for a series of schools, most of them being two-storey, and located them as best they could near the centres of population. In most cases this meant they were placed on the outskirts of urban centres because the sites needed were considerable as they included not just the school buildings but also sufficient space for recreational activities, particularly for boys’ schools. As can be seen in these two photographs, both building and recreational areas were enclosed by a secure wall, visually secure around girls’ schools. The design of these early schools was carried out by the British architectural company Watkins Gray and Partners in the late 1950s, with structural advice by Ove Arup and Partners. The schools were constructed of in-situ concrete frames and floors with concrete block infilling for external and internal walls. Finishes were painted cement render to walls and terrazzo tiling on the floors. These materials were found to create very noisy spaces for teaching and circulation areas, so acoustic ceiling tiles were later used but proved relatively ineffective. Air-conditioning systems were also incorporated into the later schools and retrofitted to the older buildings. As can be seen in the two photographs above, the schools were designed to a standard formula, both for girls’ and boys’ buildings, and were nearly always two storeys high. Occasionally there was a departure from the plan form, as in this school at Umm al-Guwaylina, photographed in 1976, though I don’t know the reason for this particular design if it was not just to do with a shortage of land. Class sizes could be relatively large, although the government attempted to keep numbers down to around thirty-five. In this government photograph of a girls’ primary class it is possible to see that the class fills the room with thirty-six possible desk spaces. Note also that the windows were deliberately situated above seated eye level to reduce possible external visual distractions. While education was provided by the Qatar government for its own nationals as well as many of the Arab speakers resident or entering the country, there was an evident need to educate the children of non-Arab speakers who were also rapidly increasing in numbers. Schools were quickly established, favouring their own nationals, the main schools being created for English, Pakistani and Indian students, particularly at infant and primary levels. Here the sign on the back of a bus in 1973 reads ‘Pakistan School’. There was also a need to educate younger children of many different natural languages. This was met by nursery schools that opened up in the homes of expatriate residents, essentially continuing the type of nursery schools that operated in their home countries. They were unregulated and depended upon trust by those leaving their children in the care of others, usually qualified teachers. Due to the relatively small size of the expatriate communities, this appeared not to be a difficulty. Where mothers were unable to work, the nursery schools also fulfilled a useful secondary function where they could meet and exchange news and experiences – an important issue in a foreign country. This photograph illustrates the external play area of one of the English-speaking nursery schools which was housed in a private residence, and looked after children of different nationalities. 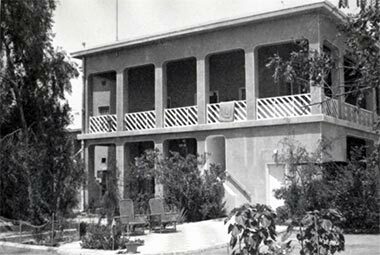 One of the first English speaking schools was the Doha English Speaking Primary School, built in 1971 on land donated by the Government. Catering mainly for British students its purpose was to allow children to come from British schools, continue their education in Qatar, and return to British schools with no disadvantage, the educational system being regularly monitored by the British Government’s Inspectorate in order to assure standards were maintained. The Primary School quickly became unable to deal with the numbers of children from the British and other English speaking nationals entering the country and a competition was held for the design of a Junior School in 1976. ADA’s winning design was built and opened by H.M. Queen Elizabeth in February 1979, being known as the Doha English Speaking School. Later, in the 1980s, it was expanded and took the children from the Primary School, the land reverting to Government. This group of photographs give an indication of a different approach to the design of school architecture from that produced by Qatar’s Ministry of Education for its own nationals and Arab speakers. Here, in one of the schools for British children constructed in Qatar, it can be seen that there is a more international architectural vocabulary operating, creating a familiarity for children coming from abroad. Developed bearing in mind the scale of infants and small children, and with relatively small classes – around twenty compared with the thirty of Qatari schools – the classrooms of the Doha English Speaking School were designed to have narrow roof lights facing a little way west of north in order to bring a useful quality of light down into the teaching spaces, supplementing the daylighting entering from the associated courtyards. The classrooms were organised with access from an enclosed circulation corridor, each having a partly enclosed courtyard enabling children to enjoy some of their lessons outdoors when the weather was clement and the curriculum suitable. These courtyards contrasted with the very open playground, part of which is shown in the photograph above, taken on a special event, with some of the classroom north light roof structures visible in the background. This photograph gives a view of the north light on one classroom, taken from below a more recently added shaded external area. This illustration was taken within one of the classrooms or teaching spaces, and shows the narrow north light supplementing light from the courtyard associated with that classroom, the windows to which can be seen behind the students. In the lower photograph, something of the character of the open corridor with its timber pergola shading and planting can be seen, together with a glimpse into one of the external courtyards. It appears that the rationale behind the design of these two related spaces, the corridor and courtyards, was to give a sense of enclosure and safety, with the intent of developing spaces suited to the scale of children rather than adults. Note the low height of both the window cills to the classrooms compared with those in the State schools above, as well as of the seating in the courtyard. In order to benefit its nationals, and to respond to requests for housing better suited to their needs, the State began a programme of large scale housing development in different parts of the country. On the outskirts of Doha a large area of land was set aside for a major scheme in the 1960s. Referred to in the early 1970s as Madinat Khalifa – and providing housing for ordinary Qataris as compared with Qataris recognised by educational and professional attainment as Senior Staff – the scheme took some years to complete, though people were living in the houses well before the roads, utilities and associated social and public services were installed. The first of these two aerial photographs was taken in August 1972 and shows the beginnings of the scheme constructed adjacent to the Technical Training College, south of the Khalifa Road and east of the North Road. The lower photograph looks south-west over a part of the same area of Madinat Khalifa – that part in the centre left of the photograph above – and was taken in March 1976. Both photographs illustrate a project under development. More about the project to provide housing for nationals can be found on the page looking at public housing. In contrast with many of the other buildings constructed prior to 1970, most of these houses have not been redeveloped, but the majority of them have been significantly extended, mostly with external additions within the compounds for both living and commercial reasons. Although the housing was originally constructed for, and given to nationals, many of them were rented to non-Qataris living in the peninsula as the result of a shortage of suitable housing for the growing expatriate community. Something of the character of the fronts of public housing and their access roads at Madinat Khalifa can be seen in the first of these two photographs. While this might be thought barren from a Western perspective, it has resonance with the traditional character of housing in this part of the Gulf. The lower photograph shows an illegally opened boundary wall developed into a local shop. These were very common in the housing areas but fulfilled a purpose as the Government took time to develop markets in the area and, even when there were local markets established, these small-scale retail outlets were seen as necessary. The need to house expatriates arose with the increasing numbers moving into the peninsula in order to assist in developing necessary technical and administrative aspects of the State. In one of the first initiatives, a small number of Senior Staff – mainly doctors, engineers and security personnel – were given purpose built, two-storey housing in Rumaillah, around the Guest Palace, north of the hospital and south of the fort. The structures housed either a single family or two families, one at ground floor level, the other at first. The design of these houses borrowed from earlier buildings in Doha. Their architecture might be considered to have developed from the main structure in Sheikh Abdullah’s development at feriq al-Salata, via the British Residency building due east of the Diwan al-Amiri. They were designed with surrounding balconies to provide a degree of shelter from sun and rain, and were constructed by Darwish Engineering with rendered cement blocks for walls and columns but with the more traditional mangrove pole construction for the first floor and roof, the poles being exposed over the balconies. Unlike the above mentioned examples, there was no decorative treatment at the top of the columns other than a rounding at the junction of the column with the lintel. Access to the first floor was by an external or open staircase, and the floor to floor heights were extremely generous as, originally, cooling was to be created by traditional methods of air movement and ceiling fans. However, by the latter 1960s, air-conditioning was providing comfort to the residents. The houses also benefitted from significantly sized gardens, and some had accommodation for servants. The original airport in Doha was constructed some way to the east of the town serving, essentially, those involved in the oil industry together with businessmen making their first steps to develop professional and commercial interests in Qatar. 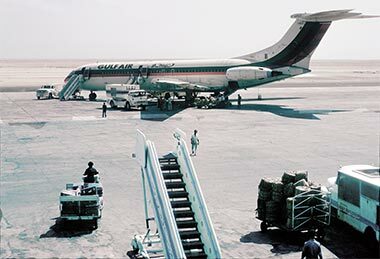 While some flights were made into Doha, there was also a landing strip at Dukhan on the west side of the peninsula, established to serve the oil industry. In order to provide for the increasing number of visitors Doha’s airport was expanded in, I believe, the 1960s, replacing the relatively simple arrangements that had developed since the Second World War with more advanced passenger and freight facilities. In addition buildings were provided for policing and fire services to give a degree of protection to activities in and around the airport. The front, passenger entrance is shown in the left side of the above photograph – one of a number used by the Government to illustrate the modern side of the State – while customs and freight operations were carried out in the single storey element of the development, shown on the right of the photograph. The roof of this part of the building was accessible by the public who would use it to watch the flights coming in and out and check for friends and business contacts arriving and leaving. It was particularly popular at night, although eventually this access was stopped due to the numbers of the workforce using it as a recreational activity. Architecturally the buildings embraced an international style with little effort made to utilise or refer to the traditional architectural vocabulary of the peninsula or region. The roof over its west facing façade was carried on expressed beams held by tall columns, free of the façade, but offering little or no shade to the spaces within the building. There were, however, a small number of maraazim to throw water off the roof, and with an arbitrarily larger arrangement on the lower roof. This aerial photograph shows the airport, viewed from the south-east in October 1972 with the urban development of Doha on the left with, behind it, the island of Safliyah and the east coast of the peninsula. The Oasis hotel is the building complex on the coast towards the right hand side of the photograph with, on the right hand edge, the old Gulf Hotel. Just above the Oasis hotel, Doha’s sea port stretches across the photograph with the main jetty on the right. The runway was aligned almost exactly with the shamaal, the dominating wind sweeping the peninsula from the north. The Control Tower and associated administrative buildings were located to the south of the main terminal buildings. Constructed in the mid-nineteen sixties they were a necessary element of the expanding airport. To their south-east were the structures containing the vehicles relating to emergencies and security in and around the perimeter of the airport. As can be seen in this aerial photograph, taken in September 1972 looking north, the structure was designed as an administrative three-storey reinforced concrete framed building with an octagonal tower supporting the control functions of the airport. Like the terminal buildings, the Control Tower was designed in an international style with no architectural reference to the local architecture. Behind the control tower can be seen the car parking area to the left with, to the right, the main terminal building housing the incoming and outgoing passenger facilities, baggage handling and police and customs. Airside, there was a single runway with a parallel taxiway between the airport buildings and the runway. Later in the 1970s a shorter runway was added to the north-west of the existing runway. This photograph shows one of Gulf Air’s VC10 fleet parked on the apron adjacent to the airport building. It illustrates the common way of entering and leaving aircraft by way of a mobile staircase, and the practice of walking across the apron between aircraft and terminal, all passengers moving at grade when entering and leaving the terminal building. In addition to the passenger, freight and administrative facilities located within Doha’s airport, there was also a military component located there. The Qatar Air Force operated four Hawker Hunters from the airport, making regular daily sorties for both operational and training purposes. The Hunters were a common sight, mostly on their regular morning flights. There were also a number of helicopters operated by both the Qatar Air Force and Qatar’s Police Force for a variety of purposes. This airport development was superceded by the complex now considered to be the old Doha International Airport which, in turn, has been superceded by the significantly larger Hamad International Airport, constructed partly on reclaimed land on the other, east, side of the existing runways. These three photographs illustrate a little of the history and character of the original Khalifa International Stadium. 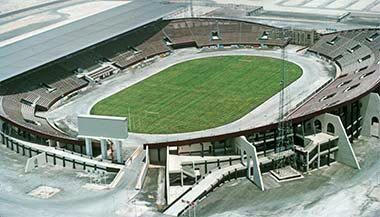 Designed to cater for around 20,000 seated spectators, the stadium was constructed rapidly in early 1976 some way to the west of the centre of Doha and south of Rayyan. For many years there had been discussions on the need for a stadium that would be a suitable location for a variety of international events. The existing football stadium that had been constructed in feriq al-Rufaa to the east of Doha in 1962 was the location for a variety of sporting and cultural events but did not have the capacity and necessary ancillary accommodation for modern sporting events and their support. In addition there were serious access and parking difficulties to and around that site. By the mid-1970s the possibility of hosting a prestigious football event – the Gulf Cup of Nations – had become a political reality and was the impetus for replacing the old Doha stadium with the fast-tracked construction of a more modern stadium in March and April of 1976. The original Khalifa International Stadium – of which the above aerial photograph was taken in August 1976 – has been radically changed. The new stadium now has a very different character, having been renovated, updated and significantly expanded with the seating enlarged to accommodate up to 40,000 in 2005. The Oasis hotel has been included in this list of the older buildings in Qatar as it fulfilled an important function in the development of the State. Constructed some way east of the centre of Doha on the Ras Abu Aboud Road, it sat a little to the east of the flight path of the airport’s sole runway. Despite this, many of the early visitors to the peninsula were housed here privately or by the State, and the building was used as an example of note in the early public relations managed by the State. Illustrating the hotel’s south facing entrance, the photograph above was taken from an early video advertising some of the advances being made in the State, and is dated from 1965. The interior of the building was decorated in an international, quasi-Arabic style, this photograph illustrating the Arabic styled first floor sitting area with its low tables and seating, panelled walls and Persian carpets. These two aerial photographs were taken respectively in May 1975 and September 1972. The first shows the south-facing façade of the hotel with its mushrabiyaat and colonnade protecting the centre of the hotel and side windows from solar gain. The lower photograph illustrates the character of the north- and sea-facing façade with its balconies, though with no need to shade the windows from the sun. Behind the hotel, on the shore, can be seen the Beach Club, which shared the sea frontage with the Doha Sailing Association. The development in the foreground of the lower photograph was private. Sadly for many, the hotel was demolished in the early part of the 2000s, the Beach Club and Doha Sailing Association having moved to the New District of Doha many years previously. As mentioned in the note above on the Oasis hotel, the development of the State meant that increasing numbers of visitors were being attracted to the peninsula, and required housing in modern hotels. There were a number of small hotels in the centre of Doha, but there were not, as yet, hotels of an international standard. The first major hotel to be constructed to this standard was the Gulf hotel, designed by the architect William Sednaoui, and situated further east along the Ras Abu Aboud road, with construction beginning in 1971. The photograph above was taken with the basic structure completed in September 1972. It was a very popular hotel though it was considered to be some way out of the centre of Doha. The hotel was oriented so that its rooms faced north-west and south-east giving excellent views of the east and west bays north of the centre of Doha, as well as the port and its activity. To the south, there were views of the airport and the eastern littoral with Wakra in the distance. The room windows were protected from the sun and solar gain by shading and balustrading devices and enjoyed relatively generous balconies. However, due to the rapidly increasing demand for hotel accommodation the hotel had another wing added to it in the mid-1970s, this time with the rooms facing north-east and south-west, but with a similar architectural shading device to match the existing building. The photograph above shows construction in progress on the new block in May 1975. As can be seen in this aerial photograph taken some time after 1975, the extension to the hotel was significantly larger than the original block. The hotel still stands, but the western extension has been clad in glass. The next hotel in this chain of development was the Hotel and Conference Centre, whose construction began in early 1978 at the tip of the new development in West Bay, the New District of Doha. One of the debates that flares up every so often is the role of the designer in the direction and meaning of ‘Islamic design’. At the beginning of these notes I suggested a reason for regarding architecture of the Gulf as being ‘Islamic / Arabic design’, and I won’t repeat that here. However, it may be useful to take a brief look at the character of the architecture that is now being designed and let you make up your own minds for the degree to which it might be thought to conform with both Islamic principles or local architectural traditions. There is an example of it above. The development of the centre of Doha at the turn of the century has witnessed a significant amount of construction designed in a pastiche of the traditional architectural vocabulary of the peninsula. The original retail centre, suq Waqf, was reconstructed almost accurately, though with the addition of a number of novel interventions in order to become a destination for tourists. In this development a form of traditional architecture evolved that took much of the vocabulary of the relatively small scale traditional buildings and used them to design and construct larger buildings. This can be seen in the photograph above. But prior to this initiative the first major developments in Doha in the latter quarter of the twentieth century were considered to be more modern in concept, and some were designed to have an ‘Islamic’ feel. Here is a view of the south-west end of Grand Hamad Avenue, looking north. It is the major transportation route that runs through the centre of the old Doha suq, effectively splitting it in two. The lower photograph is of the top, north-east, end of Grand Hamad Avenue and illustrates a very different character of building, a reflection of the history of planning in Doha. The only point I wish to make now is to do with the way in which a street changes its character. At the north end of the Avenue the structures reflect the retail uses historically carried out in the old suq. Those buildings at the southern end were planned to be taller and to cater for the larger commercial areas that were required in response to the new organisations being developed and expanding as the country took advantage of the increasing wealth flowing from the processing of gas and oil. But when you look at the view from the north end of Grand Hamad and see the new architecture of the business district in the New District of Doha, you become aware of a great disparity in architectural styles not just between the two different styles facing each other on the east and west sides of Grand Hamad, but particularly with the new buildings over West Bay and their very different character in terms of scale and materials. In a sense this reflects the different land uses of the old central area of Doha and the New District. But the latter very much represent a Western concept, the buildings of the New District reflecting predominately Western styles of architecture. This photograph appears to show them as being relatively close when they are, in fact, around three kilometres away from where the photograph was taken. The development of planning in Qatar saw the master plan for Grand Hamad develop around the same time that the New District of Doha was being designed, development at that time being seen as a longer term and slower process than that which developed just before the turn of the century. Grand Hamad was intended to be a ceremonial drive focussed on the West Bay, particularly on a tower that was to be constructed on the site of the old port. While that project never went ahead, at the south end a pair of crossed swords at Grand Hamad’s junction with the ‘B’ ring road was constructed as a formal entrance from the south, and as a focus to those approaching from the north as can be seen in this photograph. At the time Grand Hamad was designed, thinking was that it would be difficult to find uses for the land adjacent to the buildings fronting the road for some time, so planning located parking at grade behind them. It was also realised that it would be a slow process developing buildings along it, particularly with competition from the New District of Doha. From an urban design point of view, few controls were specified for the buildings fronting Grand Hamad, but perhaps the most serious shortcoming was in a lack of vision for the design of the road itself. Viewed from its central reservation you can see here how the road physically constrains access across it while at the same time providing little else but a fence and flowers, thus missing a major opportunity to benefit the centre of Doha. You can contrast the first two photographs taken on Grand Hamad in the old centre of Doha with these two photographs that were taken within the business district of the New District of Doha in December 2009. They give an indication of the scale of development now being constructed in Qatar, albeit constrained for the most part within the New District of Doha. Despite the relatively wide roads established in the NDOD, the height of the new buildings constructed there is beginning to create the canyon-like effect seen in urban centres such as New York. But there is a much greater mix of architectural styles being designed and built as can be seen in some of the buildings glimpsed in the lower photograph. The benefit this creates in terms of urban interest and way-finding is to some extent countered in the continuing discussions relating to Islamic architecture and honesty in design that are both features of professional and scholastic interest. Some of those aspects are discussed on these pages. I have to say that the examples I show here are really believed by their different designers to be ‘Islamic design’ as it is usually termed. If you wish to see more examples I strongly urge you to track down the architecture of Dubai where there is considerably more work being carried out, and on a larger scale. Let me start by saying that there seems to be considerable lack of understanding of what ‘Islamic design’ is, and also suggest that many clients have no idea either and, worse, often direct the design as they do elsewhere in the world. This first example is of a five and six storey apartment block and is very typical of the style of building which characterised the rapid development of Doha. The reason it’s here is because it’s a very simple, squared-off block with an unalleviated parapet line, square window openings, aluminium fenestration and protruding air-conditioning units but, applied to the wall are pairs of pointed arches – a style that is not particularly local – with not even the benefit of providing shading to the windows from the strong sun. The second photograph illustrates a development of the first, this time with a classical Western elevational framework and a form of naqsh applied both to the façade and in front of openings. Half the windows are protected where they occur on balconies. Where they are not, there is no protection. You can see that most of the curtains are drawn and I suspect that is because the residents are attempting to protect themselves against solar heat gain. Interestingly there are no air conditioning units on display and I don’t know how the rooms are conditioned. Which is more than can be said for these two arrangements where it is only too obvious how air-conditioning is effected. These are new buildings and I find it absolutely incredible that the architect has not been able to make better provision for these units than what you can see here, particularly in the top photograph. What might have been a small but usable balcony has been given over to units which not only make access impossible but will be a major source of heat, vibration and noise, as well as obstructing the door or window. My guess would be that somebody changed their mind with regard to the type of air-conditioning or that this is a really bad case of a problem which many architects seem to suffer from; a lack of care for those who will live in their apartments. In the lower photograph the problem is obvious, but they are unsightly and, massed as they are, will create problems with both vibration and noise. The photographs above illustrate that designers are still making poor decisions that affect people’s lives. Here is an illustration of a similar, though older example. It is a detail of the top two floors of a three storey building, now beginning to show its age. The balconies demonstrate spalling of the concrete, but this is increasingly common as poorly constructed buildings age under the high temperature and saline air content of littoral development. But what I really want to illustrate here though, is the poor design decision that locates the air-conditioning units at the height shown here. Not only are there three units on each small balcony, they are located with their top surface the same height as the top of the windows and doors. This makes the balconies unusable for the occupants not only from their location but also from the noise and mess that is concomitant with wall mounted units. Small decisions can be important. In this case the decision to mount at this height is probably worse than the decision to mount three on the balcony; both decisions have diminished the possible enjoyment of the balcony, but it is the decision on height that has really taken away that small amount of comfort the occupants might have enjoyed. But, far worse than any of the above is this example of the later addition of air-conditioners to the residential units of an apartment block. From a functional point of view it may well be that the air-conditioners create a more comfortable environment within the apartments, but they do so by reducing the occupants’ use of the balconies and, in some instances, the benefit they would obtain from the windows. From an urban design point of view, the additions significantly affect the appearance of the building and, by extension, the area within which it is situated. It is interventions such as this which increase the incidence of urban blight within the urban fabric of Doha, reducing the land values and those of adjacent buildings. From the perspective of the State’s interest in controlling and managing utilities, many will be surprised that it has been allowed. The organisation of plans in apartment buildings often reduces opportunities for enjoyment by the occupants. This example shows how the wall-mounted air-conditioning units have been related adjacent to windows with some degree of common sense compared with those above. Here they may be unsightly but they do not impinge upon the use of the balconies. The projecting balconies provide an element of shade and protection from rain to the rooms behind, and you will note that small pipes have been cast into the concrete upstand in order to shed rain. In this case, as in many other examples, the pipes are too small and will both rust and block within a short time creating problems for the rooms behind. The other point to notice about the photograph is the habit that developed of fixing, usually, two angle irons and stringing cord or rope between them in order to hang out washing. Generally apartment buildings used the roofs for this purpose, but issues of territoriality and privacy led to this solution which kept clothes within their owners’s apartment, though created irritation in some nationals and expatriates. It is a commonly perceived problem in many parts of the world. Going back to air-conditioners, this is an even more recent building than those above and, as you can see, the siting of the air-conditioning units has been just as disappointingly determined and the work effected. The building itself has a degree of eccentricity in its massing and detailing, but the air-conditioning units have no design connection whatsoever with the styling of the building. The cabling is a mess and it is difficult to determine how the M&E consultant came by his decisions. Perhaps no designer was involved, only the supplier; but even then a neater design and installation should have been produced. Note that the units are grouped immediately above a constricted entrance to the building, and that the units appear to be lower than head height judging by the doorway on the left. Why is it that designers appear to have no control on the overall design of their buildings, and what does this lack of concern do for those moving around the building? It is disappointing that so much effort is put into the design and control of the appearance of buildings, and yet this is allowed to happen. Here, along a building of a more industrial character, there is no attempt whatsoever to hide the air-conditioning units. Note that although there is shading to one of the windows above the air-conditioners – and I don’t understand why they are not all protect in order to reduce the solar load on the building – they themselves are unprotected from the elements. This second building has a more complete design solution to the protection and hiding of air-conditioning units. However, there are problems with the solution. There appears to be no capping unit to protect the top of the air-conditioners from the sun; the leads for the wiring into the unit were obviously not well considered and make a poor entry into the housing unit; and the sloped base to the unit will stain from a combination of retained dust and rain. I can’t say what has caused the staining that already has built up. It may seem like a lot of criticism over a relatively small problem, but it is only by making incremental design improvements that we get progress. Many designers will believe that the improvements are a major step forward from some of the installations still be seen around the country, this being found on a barasti construction on the outskirts of Doha. The photograph above, and this to the side illustrate one of the many problems with the old fashioned wall mounted air-conditioners – their stability. Walls are 200mm thick and this type of air-conditioner is around 500mm deep. While the main elements inside the unit have much of their weight near the inside face of the wall, they are always dry-mounted, sometimes with pieces of wood or stones to level them up, but there is no seal around them other than a wooden or plastic trim on the inside. For this reason they can be inherently unstable. Here an owner has elected to provide additional support to a unit which is obviously unstable. However, times change and now more effort is sometimes made to conceal environmental control systems. Contrast the variety of systems above with these two examples of air-conditioning systems that have been located on top of two feature towers. Of course, with designs such as these – free-standing towers designed in a pastiche of traditional Qatari architecture – there is little choice; either the units are placed on top of the structures, or they are located at ground level and, hopefully, hidden in some form of appropriate enclosure. The first of these two solutions is, perhaps, more appropriate than the latter but, as can be seen from these photographs, the space available for air-conditioning equipment is severely constrained by the amount of space available, access, and the circular form of the space containing the orthogonal air-conditioning and other units. Access appears to have been designed differently for each tower, though it is not apparent why this should have been the case. There is another reason these two towers are illustrated here. This has to do with the architectural problem discussed above and relating to the general problem of services being exposed to view. As suggested in the previous paragraph, designers are increasingly considerate of this problem. But they tend to resolve the problem of view only from ground level. The advent of tall buildings has introduced the ability of seeing air-conditioners from above as is plainly the case with the above two photographs where the arrangement is a disgraceful mess, particularly in the lower photograph. It will be interesting to see how long it takes for designers to understand what they are creating, and how they adapt their designs to deal with this issue. These two little buildings may be pastiche, but they deserve better. Whether this building deserves better may be a matter of opinion, but here is a more extreme example of the problem, this time the mess on the roof mainly being created by a mixture of water tanks and television dishes. The first elements that will have been added thoughtlessly to the roof would have been the grp water tanks, that on top of the stair and lift well being a classic example of poor design. It really is a disgrace that designers do not consider the placing of utilities in and on their buildings, particularly when they are a necessary part of the building and can, therefore, be anticipated. The television dishes are, perhaps, another matter but again could and should have been considered prior to placement. Many years ago the State made an effort to rationalise the plethora of aerials that were springing up all over the urban environment. Perhaps it is time to look at this issue again as the problem creates an extremely untidy roofscape, one that lets down the standards to which the State is striving. This photograph is included here for a slightly different reason. The point I was making in the three photographs immediately above has to do with the untidiness of utility additions which diminish the design of buildings. While there is no screening of the water tanks shown here, it is the bed which reminds me of the early days of development in Doha when it was extremely common for people to sleep on roofs. This was a traditional way for families to keep cool in the days before air-conditioning became a common element of buildings. While parapet walls enabled families to sleep on roofs with a degree of privacy, the increasingly tall buildings created more opportunities for overlooking with a resulting lack of privacy. Generally it was, and is, only expatriates who sleep on roofs, usually because it is felt to be more natural than sleeping in an air-conditioned room. The two points to make with regard to water tanks are, firstly, that they should be screened at least from the street and from adjoining buildings if they are not to detract from the building and its design. The distance from which this policy should be maintained is a planning issue that is rarely addressed by planners and architects. In this photograph, taken within the urban streetscape of the New District of Doha, you will see there are no water tanks or dishes on display. This is to be expected in prestigious developments of this sort. But it is in the areas which are considered to be less important that little interest is shown by designers, or those who control them, in producing good quality design. The second point is that it is common sense to screen water tanks from the sun in order to avoid solar gain. I must have mentioned elsewhere that it used to be the habit of householders to switch their use of hot and cold water taps between summer and winter in order to take benefit from this effect. This might now be seen to be useful, a way of reducing the electricity loads on buildings. If so, it needs to be designed sensitively and sensibly if it is have a beneficial effect. In the meantime it should be standard design practice to screen them. This photograph is here to demonstrate a similar shape of Islamic design to that applied to the walls of the first apartment block shown above, but one which is more associated with the architecture of the other side of the Gulf, Iran. To my view it looks slightly incongruous in Doha although there is a very arguable case to be made for Iranian architecture bearing in mind that commerce in the Gulf states has historically been established by Iranian merchants, and that ordinary domestic architecture owes much to the architecture of the other side of the Gulf. But its proportions, detailing and finial design do look to me like transplants from abroad. While this is not necessarily a bad idea, its reflection of a source so near to Qatar is to me more confusing than straight copies of inappropriate Western architecture. Whether this is good or bad, I’m not sure, just confused. Looking at it from this point of view I expect it to be covered in turquoise and beige tiling and for the interior to be domed or at least arched. Somehow it seems disappointing to see it with a horizontal soffit though there are many aswaaq in Iran and elsewhere with horizontal ceilings, generally because they are constructed of timber. This development, incidentally, replaces part of the old suq to the east of the wadi whose route is now the main road through the old suq, the whole of the suq now being to the east of Grand Hamad Avenue which drives thorugh the old development from the south to the corniche at its northern end. Here is a very interesting example of a new building in Doha where a Catholic church was opened in early 2008. Internally it has a relatively traditional plan with a radiating congregation facing an altar raised above seven steps. The altar area is illuminated by light from an octagonal drum at the highest point of the rising volume of the body of the church. Outside, however, although you can see something of the rising roof and octagonal tower, the volume of the church is partially masked at its main entrance by this façade which has strong associations with Islamic architecture. I can’t believe that the design is deliberate, but the central entrance reminds me of a Persian iwaanin its scale and location, and its flanking by blind arcading suggests the horizontal hypostyle hall prayer area of a masjid, though this arcade does not reflect what happens inside the building. The massing and detailing of the building is extremely plain but there is certainly a hint of modern interpretation of traditional local architecture. It is only the lack of a burj – and, in this photograph, the obvious lack of nationals – which tells the casual viewer that this is not a masjid. The two blocks seen in the next two photographs are very typical of the kind of design which does nothing to promote Islamic / Arabic architecture in Qatar. The first is of a staff housing block in the south of the city. The use of small openings and large wall surfaces might, on the face of it, appear to be sensible. But I suspect that the walls are constructed as they are everywhere else, of a single skin of concrete block finished internally and externally with a rendered cement skim and painted. These walls pick up solar heat very quickly, radiating a lower wave length into the rooms. When the rooms are small this can be uncomfortable, the wall mounted air-conditioning units being of little use in maintaining comfort near the walls. This second example is of a kind where little seems to have been done to create a comfortable environment for the occupants. It appears to be an office block on the upper two levels but, apart from the provision of wall-mounted units, there is no treatment to protect the windows from solar gain. The fact that most of the curtains appear to be closed appears to support this. The small detail above the top row of windows is an indent, not a projection. Incidentally, it is better to have air-conditioners cooling the top of a space rather than the bottom. As a complete contrast to the usual blockwork and rendering solutions above, you should know that even outside the New District of Doha or other up-market area of Doha, different solutions to modern design are being practised. Here a three storey block has been constructed adjacent to a residential area. Most of the plant appears to be hidden behind a fourth storey screen. As an aside it is worth remembering that not every street in Doha is well designed, or is even designed to the standards I am illustrating. In some parts of the town there are streets which have been developed over time for mixed use and the accommodation of expatriate workers. This photograph shows a common treatment. Note the reinforced concrete column and blockwork walls, the standard construction method, the lack of pedestrian consideration and, what I would guess, is illegal development. Here is a more modern example illustrating a number of different issues. Firstly, the legal walls have been raised, I think for privacy, as there is evidence of a lamp on the top left which suggests a first floor terrace rather than a room lies behind it. This high wall together with the trees gives considerable shade to the passage though this is a function of the low sun angle demonstrating that there is protection from the sun near dawn and dusk. Although the passage is not really a sikka due to its greater width, it is obviously used as one as the surface has been smoothed by traffic, probably vehicular as well as pedestrian. I have argued elsewhere that the traditional, narrow sikkak are a good environmental response, and that wide passages should be avoided. As a general principle, passages such as this are ambiguous and end up being misused as can be seen by the dumped material. The passage would have been better designed at a traditional sikka width. Although it may seem counter-intuitive, it is also likely to be safer as it has at least one entrance giving onto it. The passage is also mirrored by a similar unpaved passage the other side of the paved road. It is a poor planning decision to have crossroads such as these – whether or not they are supposed to be used by either vehicles or pedestrians. There is the certain possibility of accidents. It also demonstrates that vehicles are parked in them, an issue which can cause conflict between vehicles and pedestrian movement such as children playing. I have mentioned elsewhere the manner in which Qataris have been given land to build new houses. Much of the inner area of Doha, however, remained in private hands and some owners continued to live there. On the other hand, others moved out to new land and housing and let out their old houses to the expatriate work force. Many of these expatriates were, in fact, accommodated in the old houses of the people they worked for. The result of this has been that there is a lot of rental housing both new and in old accommodation mixed with the houses of Qataris who have elected to remain in the centre. These four thumbnails illustrate the typical character of a part of the inner ring of Doha where you can see single and multi-storey buildings, mainly residential, relatively wide roads, but only the beginnings of a clear hard and soft landscaping approach, and two problems yet to be resolved – municipal rubbish bins in the road and utility works apparently continually under way. Qataris who chose to stay in these areas usually did so as their plots are large enough to ensure continuing privacy from their new neighbours. Though this may initially have been the case, the continuing development of tall structures makes this increasingly difficult, particularly for the women of the family. In addition to this, those people they see around their house plots will be mainly expatriates. There is a very strong contrast between these urban scenes and those associated with the areas into which qabila have gone and, of course, the Senior Staff areas. The former is probably the better comparison as the Qataris there are a more representative cross-section of Qatari society. Within the inner ring of Doha there remain a number of areas where progress has not matched pace with the development of the centre and, particularly, the New District of Doha. The reasons for this are various but one of the chief ones can be seen here, the size and shape of the old lots which has much to do with the ownership patterns that have developed over a long period of time. While the land market in Doha is buoyant, decisions on acquiring and developing land tends to favour discrete, sizeable plots on which buildings can be erected that will return a profit to the owner. However, due to the manner in which the labour market works it is often more profitable for an owner to keep an old building and use it to run a small business as well as house his own labour. In this way it is thought that the value of the property will remain and increase, the owner will have no problems housing his labour, and there will be no need to use financial resources which may carry with them a degree of speculation. What results is an urban scene comprising everything from single to eight storey development, side by side. Closer in to the old centre of Doha this photo, taken at dawn, gives a good illustration of the architecture of the nineteen sixties and seventies with their typical ad hoc roof treatment. Roofs were always a storage area as well as being the location for galvanised steel water tanks. These and wall mounted air-conditioning units are such common items that nobody thinks of masking nor protecting them. This photo also illustrates the scale of the new developments moving into the old areas of what is now the inner ring of Doha. The fact is that the older, inner ring areas of Doha are being affected by the character and behavioural patterns of the expatriates being moved into both the old and new buildings. This is not new and, to some extent relates to the issues of overcrowding and differing perceptions and standards between expatriate and nationals. The old housing of nationals used to be immaculate even though some storage had to be placed on roofs. But there are now too many items owned or used by residents in the inner ring of Doha for which there is no provision made in or on the buildings, but which are assumed to be sensibly located on roofs. This photograph illustrates something of how visually intrusive this can become. While the photograph above illustrates something of the detail to be found on individual roofs, there are many such roofs to be seen within, particularly, Doha’s inner ring, which create an unusually cluttered roofscape for those looking from any of the taller surrounding buildings, as can be seen in this photograph. While it is possible for the Municipality to keep the streets relatively clean, there is no way of regulating the roofs and their state of tidiness or otherwise, and it is likely they will continue to be used both for storage and rubbish as well as living for the foreseeable future, practices which run counter to the objectives of those wishing to promote Doha as a modern and progressive city. Since their introduction, there has been a problem with the placing of individual air-conditioning units in the walls of buildings. Generally speaking one opening would be left in the wall of each habitable room with an adjacent power point to provide it with electricity. The opening would be provided with a crude timber lining and the interior of the room trimmed with a wooden frame about 100mm in width. Outside there would be nothing to protect it. Thirty or more years later, there seems to be little change in some places. Here there has obviously been considered a need to provide a an unplanned wall-mounted unit and a crude hole has been knocked in the wall. I assume this has yet to be trimmed and tidied up, but whether or not it will have the kind of protection that is occasionally provided as shown above, I can’t say. In addition to water tanks and air-conditioning equipment, telephone poles with their attached wires and television aerials have always been important features of the urban landscape. Elements such as these have tended to go unnoticed and unremarked upon by most people, but give character to urban scenery. This photograph, for instance, is instantly evocative of the inner urban areas of Doha. One of the characteristics of early urban development and the concomitant introduction of television was, literally, the rise in television aerials. The masts were particularly tall and each would usually incorporate a box containing a motor enabling the owner to rotate the aerial, so tuning the programmes for best reception. These were supplemented by a range of sizes of satellite dishes, adding further interest to the skyline. The buildings above are essentially two storey commercial development. Behind them there was constructed single and two storey residential development. In the inner areas this would have been on the footprint of previous traditional buildings but, in the above areas, it was more likely to be on new sites using the recently introduced technology of cement blocks and reinforced concrete roofs. The increasing height of new development can also be seen in this photograph, but here is an example of how a land owner has attempted to maximise his returns from what is a very small plot. A two storey building has been constructed with the first floor cantilevered out and a small second floor development added, an open terrace protected by a combination of precast concrete parapet on the right and, for the most part, a wooden parapet to provide a small degree of safety. On the ground floor there appears to be a retail unit housing a tailor. The architecture itself is typical of the late nineteen sixties as can be witnessed both by the cantilevered first floor detailing but, more significantly, by the detailing of and around the windows. In many ways it is sad to see how the centre of Doha is deteriorating as development is channelled into other areas. Normally the market would redevelop buildings such as these as the land, increasing in value, warrants a more expensive building on it. But there is so much development going on elsewhere that it takes time to organise redevelopment on what are usually relatively small sites. Here is a building, probably from the nineteen seventies, showing many of the characteristics of this type of two-storey development which have been allowed to deteriorate through lack of maintenance. This character of development is generally in mixed use with some commercial activity on the ground floor and the first floor given over to expatriate accommodation, usually labour brought in by the building’s owner. The first photograph here shows the concrete rotting, probably due to its being a poor mix in the first place. Other causes tend to be the absence or poor placing of steel reinforcement, saline content of the water or sand or just poor placement. You can also glimpse one of the two television dishes bringing the modern world to the residents. The second photo illustrates a number of characteristics of this type of building. Ad hoc un-rendered blockwork additions to the ground floor, a random selection of materials to create a roof to the extension, un-trimmed openings for wall-mounted air-conditioners at different heights, unprotected from solar gain, wires running all over the place and a lack of at least a painted protection to the walls. Buildings of this sort were not designed for the climate and can be extremely uncomfortable in both summer and winter. Air-conditioning can help but many expatriate workers often sleep on roofs in summer. You can see in the first of these two photos that there is a mixture of constructions. The walls have been built with concrete blocks but the roof support is of shandal and there is a neat little traditional detail where they meet the walls, a device used to reduce the span of the poles. This house seems to represent something of the transition from traditional to modern construction. This second photo shows a very typical old door which I would guess had been built around the nineteen sixties. In contrast to the old teak doors with their heavily decorated enf, raha hinges and wooden qifl, these door were produced for the increasing numbers of houses being built, and had no details reflecting Qatar’s traditional architecture. The enf is much slimmer, the only decoration being vertical fluting along its length, and the lock seemed invariably to be a steel bolt and brass padlock. These houses were taken over by expatriate workers relatively quickly as Qatari owners moved out into new accommodation. It is interesting to see how a fluorescent light has been added above the door as has a bell switch and, later, a Municipality number on the wall. In addition to this you can see the character of steel water pipes which produced water with heavy brown sedimentation. This next photo was also taken in the inner area of Doha. The spray painted sign – lilbiy’a 5215726 – is a ‘for sale’ notice along with the telephone number of the owner. Provision for estate agencies has existed for some time, though it does not have the character of those found in many countries in the Western world. There have always been individuals who deal in property as middlemen. Property owners will be aware of the sale and those with an interest in buying property can find these houses readily. I don’t know how quickly these properties are bought, nor how they are developed. There are certainly the funds available for relatively small developments, but my understanding is that new developments on these plots are usually constructed with the intention of providing accommodation for the growing workforce, and that larger plots are preferred as they are easier to plan. There is a further note on estate agents on the page dealing with pressures on society. But the photo is also interesting for the doors. Following the traditional use of teak doors on the old buildings and the newer timber doors illustrated above that were common a generation or two ago, new technology in the nineteen sixties introduced steel doors. Not only were pedestrian doors such as these made of steel, but so were the vehicle gates that were let into the walls of the public housing developments all over the country. Fabricated out of flat steel panels and with steel strap decoration welded onto them they are extremely common, as were the welding shops that sprang up to respond to this new market. These two pairs of gates are very typical in their construction and size of those made for public housing projects, though these particular houses are not public houses but constructed in a denser urban area. Note that although they are exactly the same size, the decoration of the gates gives the impression of two different scales, adding textural interest to the urban street scene. Commonly the doors were painted with bright primary colours but, when the buildings began to fall into disrepair, the doors reverted to their rusted steel colours and textures, as this photo illustrates. When you walk round the inner ring road where the majority of housing has now been let to ex-patriates, most doors tend to look something like this one. The detailed pattern shown on the door above has also been used on this pair of blue gates. Light blue was a very common colour for metalwork to be painted, and the pattern was also extremely common as a detail, most probably because it would have been relatively easy to invent and to fabricate from a piece of cold steel bar, requiring only to be wrapped round a piece of pipe as a former and then spot welded to the flat steel panel forming the basic gate. Although there is a vague relationship to traditional design in Qatar, it appears that expedience has been more important to the fabricators than tradition. It is interesting to see how this gate has been decorated to produce two patterned areas. Curiously, the wicket gate – in the centre of the right hand leaf – has not been picked out separately but is hidden within the patterning. That gate has a modern lock to it but the bar that closes the two main gate leafs is traditional in concept, although the steel bolt on the right leaf closes into a welded pipe on the left leaf – a design detail that adds considerably to the strength of the bolt fixing, though will be a problem if either of the two leafs drop due to their weight and the weakening of the uprights holding them. This gate with its wicket standing open is typical of many of the gates in old urban Doha. Its width signifies that it was probably built around the nineteen sixties when many owners required their properties to contain the merchandise that was a growing element of their businesses, and for lorries to have access. These larger gates were found on properties that incorporated residential and commercial activities, or those that were just commercial, though in this latter case there was invariably residential accommodation associated with them where the workers employed by the owner would be housed. The bicycles outside this gate suggest this is still the case. The gate itself bears one of the more sophisticated designs to be seen around Doha, but the light blue paint has long since faded. The local steel-welding industry found themselves working hard with the developing of housing and its concomitant need for secure pedestrian and vehicular entrance gates to the new properties. With increasing movement around the peninsula there was also some consolidation of other properties around the country giving a small degree of security but, more important, defining new or existing rights. This photograph illustrates the entrance gate to to a beach property on the east coast of the peninsula. It is interesting to see that the strap pattern from which the gate is constructed is the same as that used in the gate above and, in fact, on many gates throughout the country. It is also notable that there is neither diagonal bracing nor a steel sheet to give it the necessary bracing needed in order for it to maintain its shape and not distort. This old house has been rented out to expatriate workers. There are three things to note here. Firstly, the building has been painted and appears to be kept in good condition by those renting it. Secondly, the wall has been raised to give increased privacy and a small cloth screen has been added, projecting from the entrance to improve this privacy. Thirdly, two trees have been planted outside the building and are kept watered. My experience of this type of housing is that they are kept clean and work relatively well for the occupants, if often a little overcrowded. The building has the obligatory television ariel on the roof but I can’t see any mirzam to lead water off the roof. Nor does there appear to be an air conditioner on display though I believe there must be at least one, presumably venting into the courtyard rather than to the public space as in the neighbouring example. There are, however, openings high in the walls to vent warm air. Here is a two-storey residential building under construction. The windows have a detail which makes far more sense from a functional point of view. Both the semi-circular arch and the stepped base of the detail are reminiscent of traditional Qatari architecture, and the hooding helps to cut down direct solar gain on the windows as well as keeping rain away. The projection of the first floor helps to shade the window from high sun, though I have to admit it doesn’t in this photograph. I can’t recall the orientation though I know it was early morning so there may have been solar protection later in the morning. The detail is not new, however. This photograph is a detail of a building constructed in the nineteen seventies and which would have been extremely fashionable at the time. This type of window treatment gave both solar protection as well as securing the head of the window from rain ingress. The detail wasn’t that well considered from the point of view of the rectangular aluminium window behind it, but that part of the window was usually hidden by the drawn back curtains. This photograph, taken in Wakra, is an older version of the same detail. Although I mentioned above that it provides a degree of protection from sun and rain, my understanding from the early designers was that rain was the problem, not the sun. There are a couple of interesting points to note with regard to this particular rain hood. The first is its strongly raked styling. Commonly the vertical elements would be parallel with the wall but here they create a significant design feature. The second point to note is the fact that the roof finish is likely to have been traditional because of the number of maraazim inserted to shed water rapidly from the roof and so avoid water penetration and structural damage. Interestingly some of the maraazim are positioned not only over the rain hood, but over an air-conditioning opening. Another way of protecting windows is illustrated here, but it is really not being used in a sensible manner. I suspect the reason for its incorporation has more to do with giving the rectangular openings of the building what might be thought of as an Islamic treatment. The use of mushrabiyah is mainly for privacy, though it is true it will moderate sunlight and, particularly, daylight passing through it. Here the high location of the mushrabiyah within the window opening will cut down the amount of sun falling on the glass but will have no function as a form of privacy. I might also add that the tall proportions of the sliding window behind it will guarantee that it will not slide properly but will tend to rack or tilt, jamming on its rails as attempts are made to move it sideways. Here are yet two more types of shading system, these having their roots in southern Spain. The 45° propping device to the horizontal feature adds elevational interest, but the feature would be more effective if located more closely above the windows. It may have a useful function here in the summer months. The angled shutters are, however, much more useful as well as bringing a more three-dimensional quality to the façade of the building. Views from the building tend to be directed down into the owner’s garden, providing a degree of privacy to the neighbours’ properties – when they are developed. Here is what appears to be a similar use of mushrabiyah though, in reality, it is significantly different. There are two areas of interest for me. Looking at the lower floor particularly, there is a strong feel in the rhythm and repetition for Qatar’s traditional architecture though, perversely, it seems to have more resonance with some of the development of the nineteen seventies. The other area of interest is in the theoretical and actual use of the mushrabiyah. The balcony appears to have little depth and provides more of a walkway than a usable space. But it could be argued that its width is there to position a mushrabiyah at a sensible distance from the wall. However, the higher element of mushrabiyah provides some solar protection for the wall and window, but the lower element has no real function whatsoever. In technical terms the windows and wall require different types of mushrabiyah. If it is argued that the purpose of the mushrabiyah is to provide privacy from the street, then there is an argument to be made, but the fact that the mushrabiyah is discontinuous in its height means that privacy has not been provided effectively. This argument would also apply to the treatment in front of windows and the wall when you would anticipate different treatments. The decision to have a continuous mushrabiyah treatment in front of windows and walls is not a bad one, and the continuity it provides for the urban scene is relatively sound; but it could have been improved with more consideration. Having said that, I quite like it as a development of small scale detailing. In and around Doha there used to be many examples of the external screening shown here – there is a little more discussion about them on one of the Gulf architectural pages. These timber screens have been a feature of Qatar’s traditional architectural vocabulary for some time and, as such, an important element in the urban design fabric of its towns, particularly Doha. Those buildings still standing and employing this feature are associated with housing for foreign workers. The buildings with their screens are important elements of the urban streetscape, but new development is demolishing the areas in which they are located and replacing them with the newer architecture common to a wider geographical area than the Gulf. This is an example of a mushrabiyah screen taken to its logical conclusion in a modern building. The mushrabiyah forms a continuous screen protecting the façade of the building. It is suspended away from the constructional façade at such a distance as to shield it from direct sunlight, thus reducing if not eliminating direct solar gain from the structure. It would be easy to improve this system by the addition of natural plant growth within this volume, particularly if openings are made in the structural wall to take advantage of that landscaping and benefit those using the building. The photograph to the right has been included as there are a number of points to make about this example of modern architecture in Qatar. The first is to note the relentless urban character of this sikka, perhaps because of its width calculated, I would guess, both to meet the numbers of students it is likely to take as well as to be in scale with its adjoining buildings. However, traditional architecture in the region had narrower sikkak than this and in other parts of the Arab world there are significantly narrower proportions. Planting would have helped to relieve the sikka through colour, movement, smell and association. However, although it may be over-sized, the use of colour in the panels of the adjoining walls goes a small way to relieve the urban character for those having to use it. But the feature I should like to call out particularly is the rather elegant chain detail hanging from what I believe to be a series of maraazim. The scale of the maraazim are very much Western in character and have no real rapport with traditional Qatari architecture. While the detail is taken from traditional Japanese architecture – where the drain would be directly below the chain – it fits well here and is an interesting development. My only concern for it is that in many parts of the world it would not be allowed in this position within a thoroughfare due to the danger of people walking into it, being injured, and suing. Here is an up-market house on the outskirts of Doha. Evidently somebody has taken a great deal of trouble to design and execute a building with classical allusions. Leaving aside issues such as proportion, rhythm, the correct use of pediments and cornice, and the proportions and relationship between columns and capitals, this is very similar to the example further up the page. There is the same square building, long unalleviated parapet line, square window openings and projecting wall-mounted air-conditioning units. However, the most extraordinary element of it is the traditionally designed Qatari naqsh design used in the entablature above the windows. I assume that it is a way of introducing ‘Islamic’ or ‘Qatari’ detail of some sort into the house design. But, if that was the intent, why only there? Now, contrast the apartment building and up-market house with these two photographs. 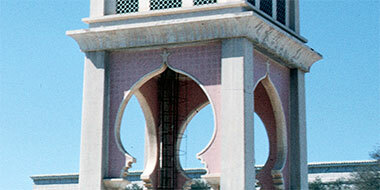 Essentially these window openings and their treatment fulfill all the requirements of Islamic / Arabic design. They are modest, do not overlook neighbours, protect the glass from direct sunlight and rain while allowing reflected light to gain access to the interior of the house. Their shape, while not – for obvious reasons – traditional in their three-dimensional form, are very much characteristic in plan and elevation of Qatari traditional design and, on the inside of the windows, their decoration with a development of traditional naqsh geometry seems entirely appropriate. My only criticism might be that it would have been more effective if the hood projected further away from the building. I should add that this house has been designed as a traditional introverted building, despite it having to abide by the planning regulations which required it to stand back from its boundaries by six metres. Not quite as effective as the preceding example in terms of its potential to overlook its neighbours – but certainly designed and constructed along traditional Islamic / Arabic lines – is this example of balcony treatment. The use of mushrabiyah is well established in many different parts of the Islamic world. Consequently it is considered to be one of the characteristics of Islamic / Arabic architecture as well as reflecting perforated Qatari naqsh panels. Light, falling on its face, causes sufficient contrast to prevent views through the mushrabiyah, ensuring privacy. At night, of course, the reverse is the case and so it is necessary to screen it after dusk to ensure privacy within the interior is protected. Usually this is effected, as it is in the West, with curtains or blinds. This form of mushrabiyah treatment has been used in the Arab world for centuries, and elsewhere in these pages you will see how it was used over the last century carved from naqsh in the traditional buildings of the peninsula. This house has an attractive group of feature windows providing views out as well as assisting as a light source as the mushrabiyah is illuminated by the sun’s movement through the day. The curved façade of the mushrabiyah with its semicircles above and below makes it a particularly attractive design element. Incidentally, note the window on the far right has a slightly raised moulding around it which will help to prevent rain running down the face of the building and being driven into the window. This is an example of an opening which was something of a signature detail of a particular architectural company in Qatar. The ziggurat style of edge trim, coupled with a naqsh treatment – I don’t know if it’s pre-cast or made in-situ – seems to me to reflect traditional Qatari architecture in a very acceptable modern manner. However, like the preceding example it does nothing to provide privacy for neighbours and, without mushrabiyah, does not protect those inside, though the depth of reveal will help by reducing the available sight lines. The Weill Cornell Medical College in Qatar has some interesting architecture within it, though I have not yet covered it other than to look at one or two of its details. Here is such a detail, an excellent example of design used to preserve privacy while admitting light. The benefit of this character of design is that the mushrabiyah will admit light either directly or indirectly received from the adjacent wall surface. It is virtually impossible to see through the mushrabiyah from outside though somebody within the building will have a view, albeit limited. to the outside. Traditionally, devices such as this are used to provide a view to a specific point, either for security or to a place where a visual focus, usually associated with planting or water, is located. This photograph of a screened walkway on the same complex has been placed here to illustrate two aspects of mushrabiyah design. The most obvious is the fact that the pattern of the design appears to be irregular but, at the same time, seems Arabic in concept. In Qatar, traditional naqsh panels were mirrored within rooms and somehow, illogically perhaps, this suggested to me that this should also be the case here. However, the only part of the design which makes me uneasy is the central, linear element which I feel should have been at right angles as can be seen further along. Nonetheless, I feel this is a successful example of interpreting traditional Arabic design. The second aspect is the degree of openness which a mushrabiyah may take. It does not need to provide complete privacy but may, as in this case, provides a secure boundary to a walkway while, at the same time, providing a degree of interest to those passing through it. I have included this photograph as it is interesting from two points of view. Here we have both windows and balconies protected by mushrabiyah. Though not as sophisticated as the examples in the photos above they do represent an attempt to use a traditional device in a modern manner. The window industry in Qatar has developed sliding rather than swinging windows so the glazing behind the windows will almost certainly be sliding, but there may be a consequential difficulty in cleaning their outer surfaces. But the photo also shows a significant example of spalling, where the bottom surface of the cantilevered balcony has fallen away leaving the balcony with significantly reduced structural integrity. Spalling has been a problem all over the country, is relatively easy to avoid and is particularly associated with a poor understanding of building techniques and control. Two factors tend to govern the problem in Qatar. Firstly, suitability of the concrete mixture; this is mainly a function of inaccurate measuring and mixing. Secondly, the placement of concrete with regard to the steel reinforcement is poorly effected. The steel needs to be adequately protected from moisture ingress to prevent it corroding and pushing off its concrete cover. Sometimes this is because the steel is trodden down in the shuttering prior to the concrete being poured, but often the reason for the steel being too close to the surface is that the reinforcement is wrongly located at the bottom of the slab in a cantilever, rather than being at the top, as is correct. I know that I’m simplifying it greatly, but I also know these to be serious problems in small building works in Qatar. Hopefully, the problem is improving, but both these photographs, and that below, illustrate that it’s not. Here, on a building that is no more than twenty years old, is a dangerous example of spalling. The rusting reinforcement of this entrance canopy has split the lower section of concrete away and there is now limited adhesion, most probably a mechanical propping, that is preventing a large element of concrete to fall. If anything or anybody is below it when it parts company, there will be serious damage but, like many such example, it seems to be ignored. In buildings under multiple occupancy it may be understandable or at least explainable, but in a villa such as this, it seems irrational to neglect the obvious danger. This may be rather a sad photograph for many; it is of the Oasis hotel being demolished. One of the better hotels in Doha of its time it was constructed, I believe, in the late 1960s very near the northern end of the airport runway and looking directly out across Doha’s east bay. The reason it is here, however, is for its sensible use of large mushrabiyah to provide some degree of protection on its south-facing main frontage. While the style of the façade bore no relationship to the traditional architecture of Qatar, the use of mushrabiyah was necessary to reduce solar loading while allowing some degree of daylighting to the spaces on the entrance side of the building. This is an effective way of treating building façades, its chief difficulty in design terms being that relating to scale. These two photographs illustrate a more sensible approach to the detailing of new buildings in Qatar than some of the more recent examples. I have argued elsewhere that there is a need to produce buildings that respond to the particular characteristics of the climate, and that this is generally not recognised by buildings that seem designed to make a statement for either their owners or architects. Yet here is a modest building that has identity and style and achieves this to some extent by the selection of a traditional device designed to protect the façade of the building from unnecessary solar gain. Although there is no decorative treatment to connect the building with the traditional architecture of the country, examples such as this were to be found in the architecture of Qatar of the fifties and sixties, admittedly imported from the Indian sub-continent and east African coast. Both louvres and mushrabiyaat are still to be found, particularly the latter. But examples of louvres such as those shown in these two photographs have, through their scale and deployment, a modern character suited to the use of the building while showing a thoughtful design response for its location in the peninsula. Before looking at villas generally, it might be useful to consider the government’s ‘Marmar’ or Guest Palace as it represented the face of the State to visiting Heads of State and dignitaries for some time. This first aerial view of it, taken from the south, gives an indication of its scale compared with the residential developments that can be glimpsed to its north. It illustrates, particularly, the concept of a single building – albeit with ancillary accommodation servicing it – set within a high security wall. Its pointed arches and green glazed roof tiles established a new standard when constructed in the 1950s. Conceptually, this is the type of residence to which most nationals aspire. Taken in 1980, the photograph of the garden at the north of the building was apparently designed with some understanding of Islamic traditions, but it could have been more effective in its presentation and use of water and lighting. There is another image of it from its garden at the top of this page. The Guest Palace was usually sufficient to meet the diplomatic needs of the country until the early 1970s. However, by this time the State was opening to more contacts both from both within the region as well as the rest of the world and additional accommodation was needed for the larger entourages accompanying, particularly, Heads of State. For this reason the Government constructed at Rumeillah four Guest Villas, arranged around a central courtyard and their plans mutually mirrored. The construction was of reinforced in-situ concrete with only limited openings to the outside, those being masked and clad with mushrabiya. This view of them was taken from a postcard issued by the Ministry of Information and shows the approach and something of their character. There is a little more written about them on the next page. So far it is mainly details of the commercial urban scene in Qatar that have been looked at. However, residential accommodation represents the major part of most cities and perhaps more can be learned from aspirations and values by looking at how people present themselves. Any visitor travelling around Doha will have been struck by the size and architectural styling of the houses that are springing up. The larger houses are particularly striking as they represent solutions to a series of difficult design decisions for architects due mainly to their size and the particular demands of clients. In this photograph a wide architectural vocabulary has been developed to produce this heavily articulated building with its topiary ficus trees outside providing some contrast and relief to the boundary wall. Some of the housing built in the 1970s was developed with an effort to create a degree of protection for those using the houses. Without the sloping roofs of that above, this house was one of those constructed on the New District of Doha for Government Senior Staff and demonstrates an effort to protect the windows at first floor level from solar gain with solid screening. Internally screens or curtains would give a degree of visual protection for those living there. Strongly modelled the house is also extremely large for its site and will have been greater in both its footprint and square meterage than was contemplated originally for the New District, a rule devised based on planned utility loads. Sadly there has been no real effort to hide servicing either on the roof or with cables leading down the walls. By contrast, this house is more representative of houses being built for Qataris, though I am not able to say if this is lived in by a Qatari family or an expatriate one. I think it’s the former, but could easily imagine it being the latter. Some effort has gone into the design of the window openings but the location of air-conditioning units above them are unsightly from the outside and will be difficult to access inside due to their height. An interesting point to note is the patterning of dust that has attached to the pre-cast concrete boundary wall panels. The reason it is shown here is that it is a cleanly designed piece of work, and an unremarkable example of some of the villas being constructed in the peninsula. As such, it is remarkable. Before moving on to the more recent buildings in Qatar, it might be interesting to look at some of the first generations of villas built in the late nineteen-seventies and early nineteen-eighties. This first illustration is not of a villa but is here because it was an early building and its design very interesting for that period. I can’t recall its use but the notice on the right is for a women’s entrance and, as can be seen, there are few windows on the building suggesting that it had a use which required no or little natural lighting. The semicircular headed openings, combined as many of them are with vertical slits, provide a hint of a traditional architectural link, although the lack of an articulated skyline or footprint suggest an intent for the building to be modern in concept, and not otherwise rely on past influences. Compare the design of that with this building, also not a villa, but having many of the characteristics of contemporary and later villas. Here the semicircular feature, common to traditional architecture, has been allied with strong vertical buttresses and slightly projecting hoods which provide some degree of shade to the windows as well as articulating the roofline in simulation of the shurfa commonly associated with fortified buildings. Many of the early villas were large and followed foreign design traditions. This villa is a case in point. The main design feature is the use of deep, projecting balconies with tiled, sloping roofs giving shade to the balconies, but with two of the balconies glazed with unprotected windows which will create heat build-up within their enclosed spaces. These sloping roofs were common features, their construction being of in-situ concrete with the tiles directly applied and, in common with the construction of roofs for many years, no thermal insulation. Here is a more developed example of the previous roof type, and one which was popular in the early years of new developments, influenced most probably by the design of the Guest Palace at Rumeillah, shown in the aerial view of it above, which formed a model for many designs. While this villa has extensive fenestration, the angled buttresses create a certain amount of shading to the windows as well as offering a minimal degree of privacy, but only from oblique angles of view. By contrast, here is a villa which illustrates a radical departure from the majority of the villas being designed in the nineteen-eighties. With foreign styling it nevertheless used a vocabulary of horizontal and vertical elements to provide a degree of solar protection to its façade as well as helping with issues relating to privacy. A considerable element of the construction budget will have gone into these features, but they provide a sensible solution to some of the problems of villa design in the local socio-cultural setting, particularly when compared with the two designs above. Incorporating shading devices with references to the traditional architecture of the peninsula, this villa is in many ways a sensitive solution to the problems of solar and privacy protection. The heavy massing suggests the architecture of fortified buildings while the stepped features of the first floor openings can be seen both in domestic urban and rural fortified buildings, though admittedly not exactly in the manner developed here. However that, together with the timber insertions in the roof balustrading, create sufficient references to traditional architecture to relate the building to past designs. Much more in the spirit of the traditional architecture of the peninsula, this villa has been designed utilising many of the features which were to be found in the old urban buildings. The villa has been designed as a far bulkier development compared with the older designs which tended to consist of groups of buildings, and it is detailed to incorporate elements such as badgheer, shurfa and maraazim even, in the latter case, where there is an enclosed room above them. Similarly there are two features obviously copied from the traditional burj al hawwa in their detailing, but having no functional operation. While this is pastiche, it still constitutes an interesting approach by an owner wanting to maintain links with his past. This photograph, a detail of the front of the building, shows novel interpretations of the windows and mushrabiyaat. Those over the windows are similar to open naqsh screens, but the patterns are not really typical of Qatar, and they each have the same design – on a traditional building they would be different. The timber mushrabiyaat at roof level have more of an Egyptian feel to them, though the windows containing coloured glass seem more local, despite their size. Some of the traditional buildings display coloured glass of primary colours with patterns not dissimilar from these, but the scale was smaller and in keeping with domestic buildings of the time. In a similar manner, here is a villa constructed at Duhail in an accurate representation of the traditional architectural style of the peninsula. It is unclear what functions the rooms have as, like the villa above, the plan form is a more modern representation of traditional arrangements, but it has a jewel-like quality created by its adherence to the proportions and restrained detailing of the old urban residential buildings. While traditional socio-cultural moraes created an urban character which would not have presented this much of the interior of the building to the outside world, this modern interpretation is a very welcome addition to the urban scene and stands in contrast to the more over-elaborated buildings designed in a traditional style. In contrast with the photographs immediately above, this villa design appears to be introverted in that the screening provided by the heavy front wall and restricted openings to the side walls combine to provide more privacy than many buildings constructed at this time. The mushrabiyaat on the front façade improve both privacy while restricting solar gain, though the shading device on the side wall may help in solar control if that façade catches the sun, but there is no privacy with respect to viewing from the neighbouring property. The front and side elevations appear to be conceived for two different buildings and, while this can be a sensible response to design problems, appears to be wrong in this context. In a number of places within these notes I have referred to the problems with privacy associated with villas. The villa above has created privacy for its users from the front of the house, but not at the side. These two photographs illustrate the problem as well as an extreme method of dealing with it. As can be seen, the villa has been designed to have large windows opening towards its immediate neighbour. Some solar protection has been provided at this time of the day by the overhanging roof, but the more serious problem to the owner has been the issue of privacy for its users. To resolve it, an extremely high screen has been constructed which, while apparently effective, is extremely ugly to look at as well as seeming unsociable. An obvious solution to the problem would have been for the architect to design the windows in a more sensible manner, perhaps using principles such as these, or something similar, to the benefit of both villas. It is a long time since this photograph, glimpsed through an entrance gate, was taken and I have no recollection of what this small building was, though I believe it to have been a majlis within the grounds of a large villa. Whatever it was, its purpose here is to illustrate that there were some radical designs created in this period and, while there were structures similar to this designed as roof structures, this is the only scheme I saw which created a whole building with this form. Oddly enough, there does appear to be a visual connection with traditional architecture, perhaps through the simplicity of its form and the articulated opening, though this claim may seem a little far-fetched to some. As I have written about elsewhere, Islamic and traditional Gulf architecture were introverted, designed to be experienced from the inside out, and specifically attempted not to embarrass neighbours by producing ostentatious buildings, this being in line with Islamic tenets. Modern buildings, as you can see above and below, have been developed as fillat, the apparent goal of every new house owner. This distant view of a villa in the desert, complete with its surrounding wall incorporating corner towers, perhaps defines how the villa sits in the collective imagination, particularly of those whose families have their roots in the desert. Its isolation and protective nature are intuitively recognised as a suitable setting both for safeguarding the privacy of family life as well as creating a safe retreat from all those difficulties that increasingly assail us. The origin of Gulf villas may be considered to have been Renaissance Italy, the style percolating down to the Gulf through the northern Arab States over time. However, the theoretical villa has changed in this process and now is envisaged as a large building within as large a walled compound as possible. Whereas some Qataris have large areas of land at their disposal, many do not but still attempt to build as much as they can within their land. This aerial photograph illustrates what everybody strives for conceptually if not in reality. But the photograph at the beginning of this section and those below are more representative of the reality. While the ability to create a large residential development in the desert is now rare, there are still some who are able to entertain this scale of project. A number of schemes have been developed investigating ways in which such a large site might be designed and enjoyed, some of which have broken away from the traditional models and suggesting alternative ways of living some way from the major conurbations. This example is such a project, designed for a site in the north of the peninsula. It exemplifies the antithesis of much that is written on these pages, but that is not to say that it might not be enjoyed by those who would live in and around it. There is a three-dimensional discipline quite different from both the traditional architecture of the peninsula, as well as from the socio-cultural patterns establishing those forms over centuries for both the badu and hadhar elements of the population. This new character of architecture might work in concept as well as in detail and it would be good to see a project such as this developed in order to test how its residents and visitors would react to the novel features it contains. Unfortunately it is not possible to examine the project in detail but some of the sketches illustrate features that would benefit those living there. The relationships between internal and external spaces would operate well much of the year, particularly with the strong planting and water features. But there are a number of problems that would need to be resolved if the project were to go ahead, both conceptual and in detail. Among them is the element that ties the project to traditional development – the surrounding wall. It seems a pity that the sensuous forms generated within it, and relating to both sea waves and sand dunes, are not able to move into or at least relate to the ground outside – assuming that there is to be no development contiguous with it, as is suggested by the illustrations. Nor is there a suggestion of how a development of this character might be self sustaining and not contribute to the growing environmental problems in the peninsula. Contrasting with it, this aerial view is of part of a spa project by the same architect as that above. It has been included as it illustrates another concept that conflicts with traditional practice in the peninsula. The architecture here is constructed essentially below ground level and makes the argument for a symbiosis of building and terrain. The important point to me is that setting buildings below ground creates introversion that may well accord with the needs of those who visit the spa and reflects something of the tradition of courtyard design. There are obviously significant difficulties to overcome with a project of this sort, but it illustrates how external designers can introduce radical concepts that might invigorate future development. A little more is written on this project on another page. Although I should write about it elsewhere, it reminds me that not a single project deals with the problems of increasing light pollution, yet how sites outside the major conurbations might take significant benefit from the night sky. While the preceding schemes are theoretical, this example of a villa is of a slightly different type from the real projects before them. It represents a number of similar developments that act as primary or secondary residences within the peninsula, as well as having a notable style. Located adjacent to the sea north of Doha this complex is large enough to demonstrate the scale of some of the developments now being built either in desert or littoral locations. In addition it exhibits a number of architectural elements that are interesting to see in Qatar reminiscent, in some respects, of architecture in the west of Saudi Arabia. The style is heavy, utilising semi-circular and flat headed arches, visually reinforced corners, battering and elements that resemble maraazim, though with open balustrading instead of traditional badgheer that have some resemblance to shurfa in breaking up the longer lines of the development. There are also two flat domes that are more reminiscent of masaajid than residential architecture. The arched glazed structure at first floor level is the only novel element that breaks with the otherwise traditionally derivative detailing. Villas are the mark of the owner. Whether they direct the design or not, the resulting buildings represent status and a number of issues which I have made notes on in other areas of this site. The two important issues to bear in mind here are that they are the first modern houses in which many Qataris have lived and so have little experience of how they are best used and, secondly, that much of this character of development does not accord with the strict precepts of Islam found in Qatar. This villa is interesting for two details. The first is the continuous verandah running round it at first floor level which, while partly screened, still permits views from outside into the first floor windows, but doesn’t prevent views into the neighbouring properties. In concept it is similar to the design of the central building in the old development of Sheikh Abdullah in feriq al-Salata. The verandah will certainly afford some protection from the sun, but with different effect on its faces due to the line taken by the sun during the day. It is a good example of form not following function, but form being maintained for some perceived symmetry of design. Notice that the villa also has areas of sloping roof. For those not familiar with construction in the Gulf, the concrete tiles will have been placed on a sloped concrete base, a form of concreting which local contractors have difficulty in placing. However, the detail which is really interesting is the focus on the water tanks and their ineffective cover. Firstly, it is extraordinary that a designer or owner should treat this functional element as such an important element of design but, secondly, it is irrational that the solar shading should be located in such a manner as will not properly protect it. This is a common problem with student designers where they believe a shade element situated exactly above water tanks will protect them, when it is obvious that the sun’s path will leave them exposed. This villa has a number of interesting features to note. The form of the building is a curious combination of fortified structure and wind tower, two forms that are not found together in traditional architecture of the peninsula. The corners are reinforced as you would expect of a fortified building, and this feeling is reinforced by the crenelated parapets, yet the corners are paradoxically weakened by the incorporation of glazed blue panels. The top of the corner elements have a vague design association with wind towers but I can’t guess at their function. The pointed arch of the first floor windows seems out of place but not so much so as do the central first floor feature and entrance canopy. The selection of the two-tone blue panels is a reminder of the importance of this particular colour in many Gulf buildings. The villa above makes interesting use of traditional architectural detailing, as does this roadside villa, though in different ways. Here the interest lies in the use of the shurfa in that it is not designed as a continuous run but as accents on the corner balanced by, usually, two elements between them. As with many recent buildings, the selection of elements of traditional architectural vocabulary suggests an effort is being made to link the building with the peninsula’s cultural past, but the grammar here militates against it, the building having little else to support this selection. Indeed the use of the shurfa creates a very uneven skyline which might have been improved had it followed the example above. The large openings are counter-intuitive, and probably environmentally unsound, and the wall planes would have benefitted from elements replicating maraazim or even shandal. It is a curious use of the traditional vocabulary of the peninsula. There are a number of villas being constructed with a vocabulary relying heavily on the fortified architecture of the peninsula. This villa, and those above, are good examples of the type. The villa shown here appears to have been designed with a similar rationale to those villas above in that it embodies elements of traditional design of a selective fortified character. But some of the decisions that have been made on distributing those elements appear to be irrational, a process that tends to diminish the architectural coherence and, consequently, the visual impact of the building and its surrounding wall. There is a body of architectural criticism that believes it wrong to use traditional elements as pastiche, but there should be little to complain about if there is design coherence, implying a logical use of the architectural vocabulary. While my comments may seem negative, there is a charm to this villa and schemes similar to it, reflecting as they do at least an interest in the national architecture that has gone before. This villa is typical of many of the private houses being constructed around the peninsula. There is little architecturally to commend it, and it appears heavy within its lot. However, the owner is doing what few do, and that is plant outside his boundary wall. Technically the land is not his, but in doing so he is observing an old Islamic tradition in taking responsibility for the public land immediately adjacent to his house. The casuarinawill eventually produce a softening effect for the front of his property, and this might be added to by planting inside the boundary wall which will display over or above the wall. There are some buildings that really catch the eye and make you stop and look hard at them. In an Islamic sense this is, of course, wrong but, from the point of view of townscape, these buildings are points of reference and attractions in the urban scene. This building is extraordinary however you look at it. Obviously based on the traditional fortified structures in Qatar, it somehow misses the better features these old buildings possess and replaces them with modernised versions that have little to commend them. The building appears to be based on a cruciform plan with a round tower at each corner and projections on each face. The battered towers with their shurfa treatment, repeated on the tops of the main walls as well as the boundary wall, are the most significant reference to the past, but there are also features which may be an interesting development of traditional architecture. There are a number of squared, projecting elements which are similar to fat’ha al murakaba. I suspect they are devices for bringing light into the interior while maintaining privacy and, if this is the case, they are a neat solution to the problem. It’s a little surprising that there are no maraazim as they tend to crop up on many buildings using traditional features. From the examples above, together with this, it appears that some of the clients now constructing their villas are having their designers produce interpretations of traditional Qatari architecture in their villas. As both these examples demonstrate, it is not easy to take a traditional vocabulary and adapt it to modern needs. Both buildings have features that appear to have little functional use – the the corner towers in the first example, the wind towers here – though this example might be thought to replicate more faithfully Qatar’s traditions. Given that State planning regulations require buildings to be set back from their boundary, and a boundary wall being a security requirement, this appears an interesting interpretation, one that appears relatively successful with the exception of the lower two towers which looks sadly out of place both in their relative height as well as their lack of congruency and geometry with the taller tower. Of course, none are usable wind towers. A number of residential buildings on this page, and others, show the influence of the traditional shurfa in the development of a modern architectural vocabulary. It is not really a detail that can be considered appropriate in modern buildings, yet it continues to be used, particularly on houses. It is pastiche, but it is possible to understand a client or designer using it as the country moves forward in its constructional development with little to use as references to the past, and significant resistance to modern design. Bear in mind that these two photographs were taken in the early 1980s. The shurfa on the first of these two houses has no function at all as the house does not need protection from attack and the roof finish is just below the crenellation. The corner detailing of the near shurfa is both inappropriate and ugly as well as appearing to be different from the corner detail further away on the left. In addition to these issues, the two water tanks at the highest level are not visually masked, a consideration that might have seen an acceptable argument for raising shurfa at this part of the house. As has been noted elsewhere, the masking or hiding of services seems to be a major failing of designers. But at least this house has more to link it to the past than the next example. Here is another variation of a shurfa, this time located higher off the roof level than the former example, but with more of a feeling of Western military architecture to it than regional association. Again, the treatment of the raised elements at the various corners of the building’s parapets differs, illustrating a lack of forethought by the designer, and there is a curious treatment of the parapet at the highest element of the building, extending into the shurfa. If these two examples of shurfa were meant to incorporate details that would ease the visual junction between sky and building, as is mentioned elsewhere, then the former is more historically accurate, as well as being a more successful example than the latter. Interestingly, note how the entrance canopies extend beyond the legal curtilage of the property, an issue on many houses at this time. By contrast, here is a house, viewed from the adjacent road and over its boundary wall, whose design is curious, but has much to commend it. The building appears to be a two storey residence designed to reflect the construction of traditional Qatari domestic buildings where vertical columns and horizontal beams were expressed, with infill panels being recessed between them. In traditional architecture the columns were of hasa, desert stones, and beams of timber while the infill panels were made from relatively thin material, often faruwsh, no more than 50mm thick, the resulting external façade reflecting this in its pattern. Here, the construction of a similarly expressed pattern is likely to be of concrete, both in situ and blockwork though the badgheer at the top of the building are probably of cast cement panels. The building seems very simple in its design, even to the extent that the stair window opening is unsophisticated in its fenestration. The top of the staircase giving access to the roof has been treated to resemble a burj al hawwa, or wind tower, though obviously it is not. The strength of the design lies in its simple symmetrical framing effect together with the visual strengthening of its corners. What is, perhaps, more surprising is the omission of maraazim, a traditional feature found reproduced on many of the new buildings designed to replicate, in some manner, a little of the feeling of the traditional architecture of the peninsula. Buildings at Dukhan, on the west side of the peninsula, have historically been utilitarian, reflecting the introduction of foreign personnel to exploit the oil and gas in the middle of the last century. Much of the building material was brought in as prefabricated elements readily assembled to provide accommodation for expatriates. Now more permanent constructions are being developed to serve those working in this area, one that has always felt distant from the activities of the capital on the east coast. Perhaps this has governed the style of architecture here where, under a dramatic outcrop, a decidedly defensive architectural character has been produced by the addition of raised corner elements, similar to those shown in the photographs above and below this paragraph. Some styling has been given to the panels associated with the window openings, but the simple forms of the buildings seem at home in this setting, establishing a strong contrast with the natural features. There is some discussion of this effect, a form of shurfa, on one of the Gulf architecture pages. Here is another example, a building under construction that appears to be a more successful example of new styling than some of the pastiche to be seen around the country. The recessed planes surrounding the openings are one of the ways in which traditional architectural character can be brought into the present, and the asymmetry of both the windows and the large scale panelling recesses gives life to the façade, again in keeping with traditional design, as is the stylised device used to raise the corners. The wind tower presents the usual problems, however; it is far too low. The interior of the tower appears to have the diagonal divisions required of a burj al hawwa, though the divisions of the tower are incorrect and the tower is not high enough to be truly functional. It is probable that air will move into and down it, making the issue of the disposal of wind-borne particulates an interesting if not aggravating one. If any of this sounds negative it’s not meant to be. Clients all over the world ask for designs which appeal to them. In many ways the design of these particular villas illustrates the strength of conviction that most Qataris feel, as well as the pride in their country that is evident in many areas of their lives. There is also the possibility that the redevelopment of Doha’s old, central suq is having an effect. The villa in this photograph has some basic similarities with that fortified style above though, paradoxically, with a more dominating presence due, in the main, to the heavy articulated cornice treatment and the massing of the entrance wall with its guard or servant accommodation and gate. However, the cornice treatment and the pediments over the windows are certainly not Arabic but of Italian origin, and the planning form of the building with porte cochèreand reinforced corners is also a classic Western style. Lip service to Arabic design is seen only in the patterning and use of arched forms to contain them, but it is essentially a Western villa which has been designed here. There appears to be a secondary gate to the right of the photo which might be an entrance to either a service yard or two the haramlik part of the house. The two might be combined, of course. There are an additional three interesting points to note. Firstly the gates are wide and have been left open, meaning that there is little privacy at the entrance to the site. Secondly, the utilitarian marking of the external kerbs in yellow and black have been taken right inside the compound where you might expect a more upmarket treatment of surfaces. Thirdly, it seems strange that two refuse bins occupy pride of place right in front of the entrance. My belief is that these are details which illustrate a transient design style, one in which decisions on taste and understanding are still developing. This photo is of an upmarket villa seen at night from an overlooking roof. It is a good example of a large villa design, the house sitting in the centre of its plot surrounded by a security wall and with similar, though smaller, neighbouring villas to each side of it. Both the vehicular and pedestrian entrance gates are of steel framed obscured glass allowing some interest at night from the street; a pedestrian can be seen in silhouette in front of the vehicular entrance gate. The long unrelieved parapet provides no scale to the building: compare it with the photograph above. The projecting arched window surround detail provides a small amount of shielding from oblique sunlight while paying lip service to traditional design. It is a fairly common design feature in Qatar. But, while some privacy might be provided by the peripheral date palms, the windows provide neither privacy nor security. I have mentioned boundary walls in a number of places both on this page as well as the Gulf architecture page from a design point of view, and on the security and protection pages from a security point of view. Generally the comment has been generated by the move from the old concrete block walls with their reinforcing concrete columns moving to pre-cast concrete panel constructions. But as you travel around Doha, particularly, you will be struck by the effort that now goes into the design and construction of these boundary walls together with their entrance gates – the latter also an area for particular comment. Bearing in mind what I have written about an Islamic approach to design it is interesting to see how highly developed some of these boundary walls are becoming. Virtually every residential villa in Qatar has a boundary wall around it and I have argued elsewhere that the perceived issues – mainly of privacy and security – might be dealt with in ways other than constructing a visual barrier. If you look carefully at this photograph you will see that the boundary wall design incorporates gaps between columns and panels that produce a degree of transparency to the wall. This is an important development and, hopefully, may see greater transparency created in the future as has happened with the example in Bahrein. The use of heavy planting to create security is sensible while, at the same time, producing an attractive display, something apparently sought by owners of most modern residences. As for the architecture of this villa, it is a little disappointing to see the mixing of design styles with Western pitched, tiled roof inserted between features derived from the development of the traditional architectural features, particularly the shurfa. The buttressed styling to the walls and the detailing of the fenestration are both unfortunate. One of the characteristics of villa design is the planning requirement to have the main building set back five metres. Development against the boundary wall appears to be permitted, provided it is ancillary and no more than a single storey. Here, however, is a rather different type of addition to the residential scene, what appears to be a dinosaur at first floor level, and close to the boundary – in fact apparently extending into the public realm with its tail. However, as the boundary in this case is adjacent to an access road, the problems of overlooking are significantly reduced. There is also the curiously inappropriate architectural addition to the top of the building to attract attention. I assume from the obvious expenditure that the owner is a national and that this may be a play space for his family, its form illustrating a sense of humour. In many parts of the world were planning permission to be sought it would not be granted and, if built, would require demolition. But it has to be said that such eccentricities certainly make the urban experience more interesting. Earlier I wrote that there are some buildings that really catch the eye. Of course, not all buildings in Qatar are designed along Islamic or traditional lines, real or imagined; some are heavily styled as is this one in a manner that must have seemed modern, if not contemporary – even though of Western architectural origin. Also it is not a villa but an office, however it is similar to many villas and so is included for that reason. There are a few villas in Qatar designed in a similar style that incorporate unnecessary structural features and where the structural expression is illogical. At first sight it seems to be of a style that is inimical to Qatar, but there are some features that are sensible – the incorporation of close soft landscaping, projection to create shade and an interesting semi-circular window – but there is much else that is unattractive. The battering, for instance, is illogical, but not unattractive compared with the orthogonal structure beside it. But it could have been better, and might even have suggested design links with local traditional architecture. It is not clear to me if this building was designed as a villa or, perhaps more likely, as a majlis. Whatever the intent and use, the building was demolished and the site cleared shortly after this photograph was taken. It is placed here for its architectural vocabulary which illustrates something of the classic designs that appear to be increasingly commonplace in Qatar and are discussed a little further below. The symmetry about the entrance, the podium entrance steps, the denticulation around the top of the wall and the three curved forms all point to architecture introduced, not just from outside the region, but from a different historical tradition. The only local design elements are the ogee arches over the two side entrances, and even they were rare. As development proceeds apace in the New District of Doha and elsewhere around the peninsla, different housing models are being introduced with the intent that they will appeal to those wishing to invest in the country, more specifically, in the areas in which this is permitted to foreigners. The decisions which have driven the design briefs are not known, but it is instructive to look at the finished designs such as those illustrated in this prestige development, where some of the houses have direct access to the beach, in order to guess at the intended markets. The houses appear to be generously sized but are grouped more tightly than the older, villa, style of development, with nominal fences and hedges enabling a semblance of ownership. However, the areas in private and public ownership run into each other quite close to the buildings, inhibiting the psychological sense of ownership and automatically reducing the possibility of their being enjoyed by those to whom privacy is important. It is also notable that the private areas adjacent to the houses, and the openings to living and bedrooms, are overlooked, again reducing privacy. It must be assumed that the buildings are adequately insulated, but their interiors are obviously reliant upon the air-handling equipment located at roof level, and not always hidden from view. This is likely to be used throughout the year. At least there appear to be no water tanks visible on the roofs, a common feature of Doha buildings. It is not possible to know if the buildings are designed to allow cross ventilation to bring cooling breezes into the houses, but the lighting lantern on the roof suggests that the houses are designed as closed systems. The surrounding planting is likely to reduce the amount of wind-borne sand and dust filtering into the buildings, which will benefit those living there, but it is unclear to me how much of that landscaping will be maintained by those living there; it appears to be little or none, which may benefit many, but restrict others with a love of gardening. I assume that the planting near the sea will have been selected to reduce the effects of salt spray and increasing salinity in the soil. Incidentally, there appears to be no provision for equipment and toys which might be used outside and around the building, though these might well be provided for within garages. The architectural vocabulary is drawn from both rural and urban traditional architecture, though the necessary large windows are at odds with both the fortified structures of the interior as well as littoral development. The architecture relies on features such as over-elaborated shurfa and false badgheer at roof level, simplified traditional decoration above some windows and in the junctions of expressed columns and beams, and a strong vertical articulation on some of the façades. Oddly, there appear to be no maraazim, a common feature of modern buildings utilising traditional detailing. Canopies are provided to protect some of the windows from solar gain, but not all, which seems illogical. The development is interesting in its departure from the older models of housing. Its appeal will have much to do with the purchase costs and conditions which have been designed to appeal to foreigners in much the same way as Dubai was marketed. Qatar seems to have escaped many of the problems experienced in Dubai and the pastiche architecture may appeal to many looking for a place to spend part of the year abroad, if not all of it. Finally, the conditions of use will be very important, particularly bearing in mind the relative lack of privacy compared with villa-style housing. It will be fascinating to see how the area develops with, as is likely, low occupancy. The development of facilities in the peninsula for both nationals and expatriates continues apace with much of the residential development being focussed on the New District of Doha. In this planned district are a small number of areas in which expatriates are now permitted to purchase housing, with the proviso that they do this for their own use, and not to rent out as a commercial undertaking. In fact, much of this area is lived in by expatriates, usually in planned residential compounds, some of them providing recreational facilities for those living there. In this photograph, looking west, a number of different uses can be seen, but the majority land use is residential. At the bottom of the photograph, just out of frame, is the gated entrance to a compound which includes swimming and paddling pools and two tennis courts. In the distance, top left, can be seen the residential compound, al-Jazi Gardens which, judging from the amount of trees visible, has been there a number of years, the houses being noticeably smaller than the more recent houses. In between them lies another residential compound with a few plots yet to be developed and, between them, is the compound of the Lebanese School with the swimming pool of the French School just visible on the left of frame. The majority of the houses above are examples of villas designed and built for Qataris with private means or those designated as Senior Staff government employees. These were individuals entitled to loans or grants towards a new house together with its running costs. Together with the house, land was also given to government employees. Compared with Senior Staff who were given plots thirty-five metres square, Intermediate Staff were given plots thirty metres square on which to build their houses. This was the same size as the plots given to Qataris in the housing at Medinat Khalifa and other locations. This first photograph shows one of the houses on the New District of Doha under construction in 1985. While the housing at Medinat Khalifa was generally either designed by the government, or based on those designs, the government took the opportunity to design and construct two-storey houses for Intermediate Staff on the newly created land at the New District of Doha. In site planning terms, these houses were organised in the same way as the Senior Staff housing, that is in the centre of the plot. However, in contrast with the Senior Staff housing, these two-storey villas were constructed of pre-cast concrete in expectation of their being a better quality of building. These three photographs, above and to the side, show a trio of similar designs completed, with a certain degree of customising both in their appearance as well as in the additions made to the basic design. In the first example, note the strong use of applied colour and the design of the external stair giving a degree of privacy to those using it to gain access to the roof. In the second example, note the development of the first floor, increasing the size of the house, but apparently taking advantage to create a terrace at first floor level – an inevitable source of privacy difficulties for the neighbour. In the third photograph, note how the villa has been increased both at first floor level but also at ground level with expansion up to the boundary, a development running against the planning requirements for housing on the New District. Having said that, I have commented elsewhere that having a villa set in the centre of its plot makes the layout of the garden difficult to design and, importantly, to use. It was evident that owners valued enclosed space at the expense of external, open space. While this might be thought understandable when the experience of enclosed, air-conditioned space was relatively novel, the difficulty in providing housing with the utilities of water, sewerage and, particularly, electricity, created considerable problems over a period of time. The resulting loss in external open space around the house was also a problem with its impact on storage, the keeping of animals and the enjoyment of the space. In the case of this owner, one of the ways to get round this was to adopt the space outside his house, creating a fenced garden with the beginnings of a heavy planted design together with a pergola with what appears to be bougainvillea climbing over it. He also appears to have acquired land to the side as the pergola and its entrance leads to a small majlis within his ownership. One of the other features in the urban design of this part of the New District of Doha was the lack of a specific hierarchy of retail outlets. This, also, has been commented on elsewhere but while planning requirements specifically were set against it, owners took the opportunity to develop their own retail outlets, responding to commercial opportunities for the basic shopping requirements of the neighbourhood. Here, what appear to be two garages are, in fact, local shops and would most likely have had somebody living there providing the rôles of shopkeeper, guard and general help, a long tradition in the peninsula. In the lower of these two photographs the accommodation built on to the boundary wall has somebody living in it. Whatever the planning requirements say, and however necessary this might be in socio-cultural terms, this is not an attractive addition to a new urban development, nor is it enhanced by rusted water spillage. As noted above there were variations to the internal planning of the houses as well as additions but, like their single-storey predecessors at Medinat Khalifa, there was a certain uniformity about their design. While the single storey houses were able to maintain a degree of privacy in their external spaces as well as between their windows, the same was not true for these Intermediate Staff houses. Planting may be able to soften the austere lines of the pre-cast housing, but it will be difficult to deal with issues such as those relating to privacy at first floor level. The concept of the villa, a building set in landscaped grounds, may work when there is sufficient space around it to allow views of and from it, but when the building takes up much of the space on its plot it poses a series of problems. One of them, which has not been addressed here, is its relationships with its immediate neighbours. This is one of the difficulties which might be resolved by redesigning them as terraced or semi-detached buildings, an impossible concept in those days and, perhaps just as difficult today. This example, for instance, is neither Islamic nor classical though leans more to the latter than the former with its coloured banding, columns, pitched roof and the continuous straight arches, broken by the exaggerated central keystones. The inset circular planters are an attractive and novel feature of the wall which, itself, is expensively finished, but it is the entrance gateway structure and contained gates that is so remarkable in its size and dominance. It appears that this mixture of styles and influence is becoming more prevalent in Qatar, suggesting an eclectic selection of designers or craftsmen were involved, or that there is a burgeoning requirement for this style from clients. It has to be noted that it is often difficult to know the extent to which the styling of a building is the result of a client’s direction or a designer’s suggestion. The incorporation of classical styling for modern buildings in Qatar is an interesting development, one on which there are some notes here setting out the background to classical architecture in its Western origins. What is evident, and can be seen in many of the photographs on this site, is that there are a wide variety of different forms of classical vocabulary used on new buildings in Qatar, as well as considerable differences of understanding of the manner in which classical architecture is structured. True classical architecture was based on good spatial proportions and a desire to produce a ‘better’ physical environment for those moving in and around the building. The provision of classical buildings for people coming from a totally different socio-cultural tradition is discussed elsewhere, but it is reasonable to bear this issue in mind when looking at classical buildings in their modern context. It is apparent that the theory of classical architecture is not generally understood and that more emphasis is placed on the incorporation of architectural elements that are thought to be classical, or are derived from them. Generally this appears to be practised as a two-dimensional exercise and not spatially. But even this form of application is rarely coherent or internally consistent. These three photographs show a building under construction in Doha. It is not selected because it is either a good or bad example, but solely to illustrate an example of classical design in Qatar. However there are a number of features that deserve comment. In contradistinction to the usual setting of such buildings with their enclosing walls, this one presents a substantial front to the world, one that is reinforced by the relatively light fence in front of it, but which would have benefited by the omission of the masonry element. The main façade appears to be designed of a single material with Ionic columns holding up an entablature without a central pediment but with a pair of low, curved broken features similar to swan’s neck pediments, at the end of each of which are small squared columns carrying rounded cones. The lack of a substantial pediment emphasises the columns which now appear to be out of proportion. The entablature – the horizontal element supported by the columns – is curious in that the architrave, its lowest part, is a copy of the cornice, the highest part, and appears illogical. The frieze, the central part of the entablature, is the largest of the three elements and is broken by buttressed features that appear to be similar in design intent to the triglyphs found in Doric but not Ionic designs. Regrettably, the construction joints of the cornice do not line through logically with these features. Just as curious is the manner in which the corners are articulated with stylised attached columns that are theoretically in conflict with the masonry corner behind them. The stylised Ionic columns, incidentally, are straight with no entasis designed into them, and it appears that the number of flutes on them are too few. There are a number of other issues where there is a lack of clarity or difficulty with design consistency, and not all these relate to the classical style of design. One of the general difficulties with pastiche can be seen in the photograph, the mixing of architectural vocabularies within a coeval design. Each of these designs is interesting to look at from a theoretical point of view but, in more general terms, it is the environmental and socio-cultural aspects that are fascinating and deserve more focussed study. There is a little more comment on one of the socio-cultural and Islamic design pages, but there is more to be written. This detail is of a corner in the Pearl complex, north of the New District of Doha. The development displays more of an Islamic feeling than does some of that found on other new commercial developments, but in this corner there is still a confusion of classic and Islamic elements to be seen. Take the balustrading, for instance, of which there are three types, two classical and one Qatari, or a version of it. The balustrading, top right, has a classical form with its handrail, newels and balusters over-designed and that, at the bottom of the ground floor, has a definite Italianate or Roman feeling to it. In contrast, the balustrading on top of the ground floor element is a derivation of Qatari architectural detailing, based on the badgheer systems used to bring breezes down onto roof surfaces. Here, of course, it is ineffective. But it is not just in the balustrading treatments there is diversity, the arches show a wide but uncoordinated selection of styles, only one of which can be found in traditional Qatari architecture, and the dome and gable wall also show mixed parentage. These offices illustrate a slightly different approach to the mixing of classical and local traditional design, though it is difficult to understand the logic behind the organisation of massing and the use of architectural vocabulary. As a grouping there appears to be a design intent to have a strongly modelled façade and the weight of masses greater on the corner. Visually, the latter accords with local traditional buildings where corners are reinforced for structural and defensive purposes. Here, those elements of local tradition are relegated to two vertical elements on the left which appear to have no logic to them other than as visual, balancing elements, a purpose they carry out relatively well. Their parapet corners are visually reinforced, as might be expected, and the shurfa between them are also used to relieve two long stretches of wall. Yet they both break a classical topping to the building which has cantilevered classical mouldings with a flat parapet line having, around the curved corner, one of the decorative crenellations situated directly below it. This is pure pastiche. It is difficult to say whether either the classic or traditional architectural elements benefit from their ad hoc use, though the building might be thought to have a certain charm to it. The design of boundary walls used to be considered an afterthought by architects, however there has always been an interest by owners in the appearance of their properties, particularly in districts such as Medinat Khalifa where the external walls and their associated gates were one of the areas in which individuality might be asserted. Originally boundary walls were constructed by government for this housing as in-situ reinforced concrete columns supporting block infill panels as shown in this photograph taken in 1976. Government went on to design and supply pre-cast panels first to the boundary walls of Intermediate and Senior Staff houses, as seen here, and then to other government projects. But there are now a number of private schemes where innovative designs are being introduced into the urban fabric. This unusual boundary wall, for instance, has two pre-cast components with integrated lighting. There is also a traditionally designed steel wicket gate filling the opening. However, while the wall is of an extremely strong construction, its design might be thought to create a security risk in that it offers hand and footholds. From this photograph you can get an idea of how these heavy panels are set in place. A pre-cast base unit has been placed below grade and levelled up, and then the semi-circular pre-cast wall units lowered into position and their horns used to level the panels vertically with what appear to be plastic shims prior to concrete being poured to complete the stabilising work below grade. The rebate in the edge of the wall is used to locate the fan-shaped pre-cast unit which will be lowered into place and held in place mechanically. It is an interesting if not attractive design, though one which creates a curious sense of scale, seemingly lower than a rectangular wall of similar height. The boundary walls illustrated above, and others on these pages, are domestic in scale. Designed to create privacy and deter casual intruders, they are rarely more than two-and-a-half metres in height. The example here is of the wall along the west flank of the Diwan al-Amiri and is significantly higher. This is not just a requirement for physical security but it is also a response to the need for scale in matching that of the Diwan. However, the principle is the same with an in-situ concrete base cast to take pre-cast columns between which pre-cast panels are lowered and fixed. This photograph shows the cast base, the main and standard columns, a standard panel and a drop panel, the latter designed to allow the wall to follow the contours of the raised ground on which the Diwan al-Amiri sits.